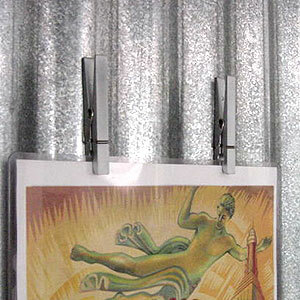 Descriptions of furniture, accessories, and artwork. A welcoming introduction to the interior spaces, the cornice molding visually lowers the ceiling to a more personal human scale. 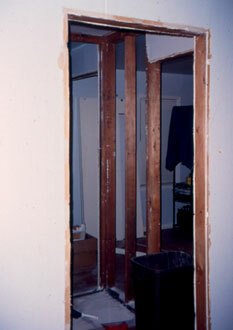 New doors lead to the groj and to the bedroom. 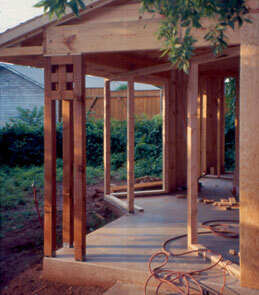 From this area of comfortable tradition, one can then step into the areas of contemporary open spaces. 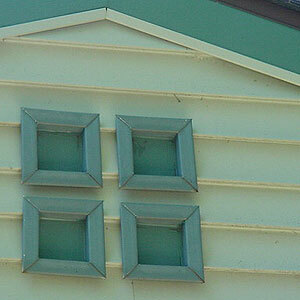 The heat/ac vent grilles - series of three round vents are aligned with the front windows and angled in the corner rooms. 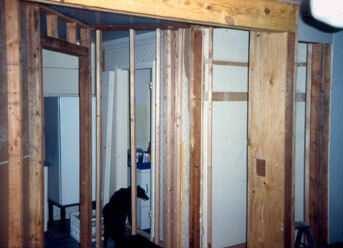 • The 1952 closets were removed to enlarge the space. 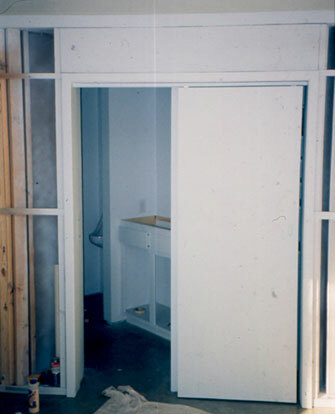 The new closet is a rolling unit with all the necessary compartments. Watson doesn't like the awkward inconvenience of opening and closing closet doors (what is there to hide?) 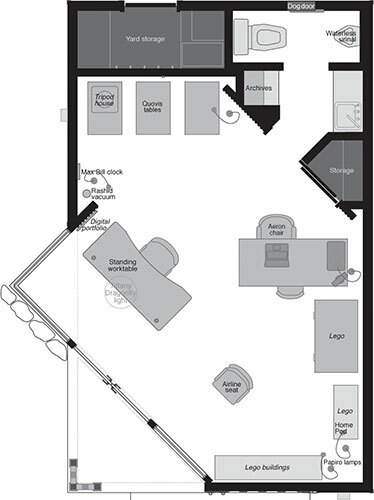 The closet and rolling laundry cart are created from industrial shelving components that are throughout the house. 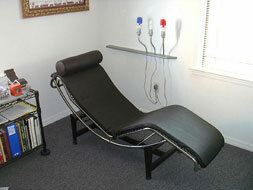 The bed has a slanted headboard and cushion for comfortable positioning, and reading lites. 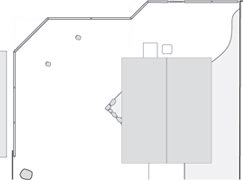 The lite switch is conveniently located on the front of the nitestand. On the bed, Watson uses only a bottom sheet and a comforter or bedspread (depending on the season). 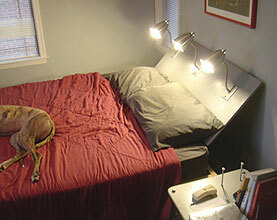 Making the bed consists solely of smoothing the bedspread over the bed; no multiple layers, and no sheets to tuck in. 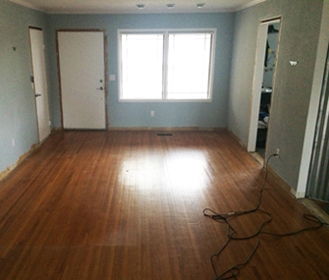 The carpet in the house is industrial grey to enhance the loft-tech look. • The bed faces the window view of the naborhood and the UCO campus. 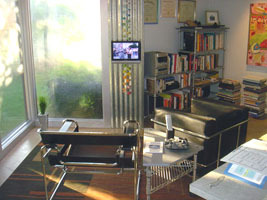 There is no TV in the bedroom, nor desk nor easy chair. 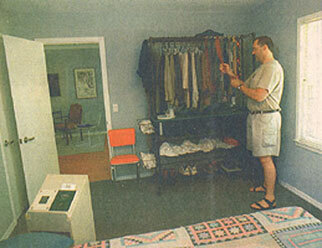 This room is solely for sleeping, reading in bed, storing clothes, and dressing. • Curtains hanging on taut cable suspended from the ceiling. 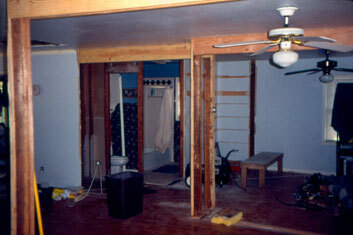 The original wooden doors got in the way. 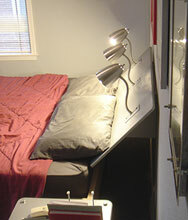 • Reading lites mounted into the headboard. 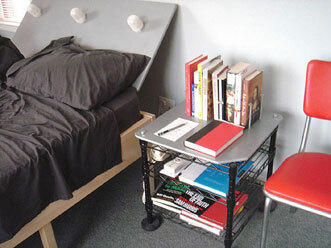 These shine directly into reading matter while lying in bed. lites next to a bed with a shade do not lite reading material adequately. 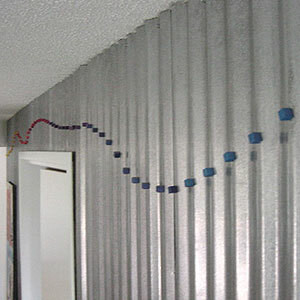 There are blue rope lite under the bed that faintly lite the floor when going to the bathroom at night. Switches for these lites are in the three recessed holes in the nitestand for convenience of finding the switches at night. 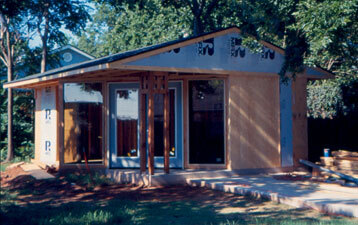 Demolished and renovated: 1995. 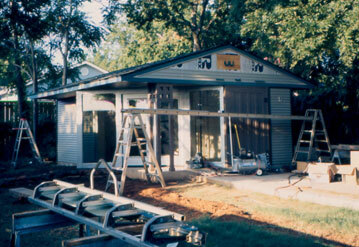 Remodeled: 2004. 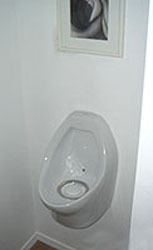 Waterless urinals: 2007. 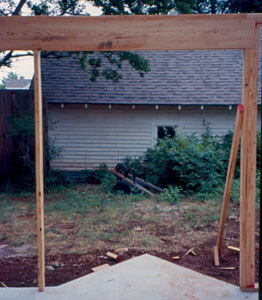 The framed mirror is full length and accessible. Why bother leaning over a counter to get close to the mirror? 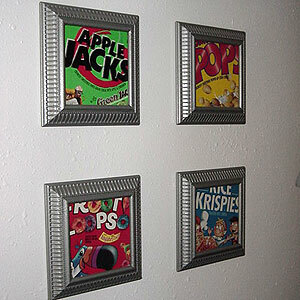 Mount it where it is easily accessible. 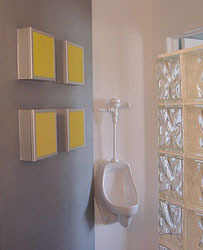 The wall fixtures align and the only electrical outlet is inside one of the medicine cabinets. 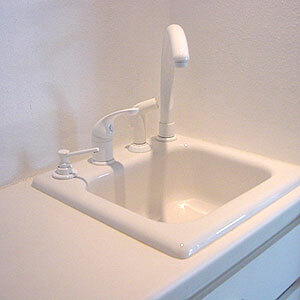 Countertops and undersink cabinets in bathrooms just collect junk. 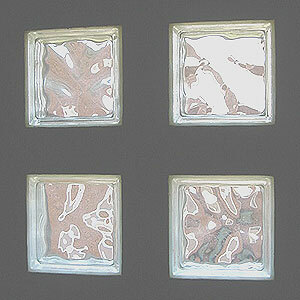 Window: Reminiscent of Arts & Crafts patterns, especially those by the Scotchman Charles Rennie Mackintosh. 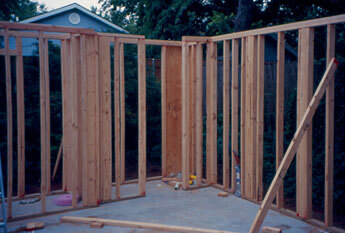 • Shower stall: defined by a wall of glass block, popular in homes and offices of the 1930s. Watson dislikes stepping over a tub and ducking under a shower curtain rod. 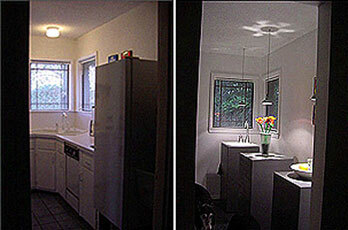 The fixtures and faucets are unobtrusive white. 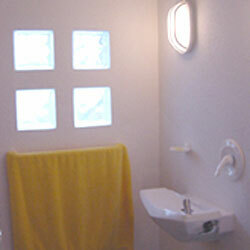 Lighting: on the wall to better lite oneself looking into the mirror and into the shower stall. Spotlite on Elvis over the toilet. 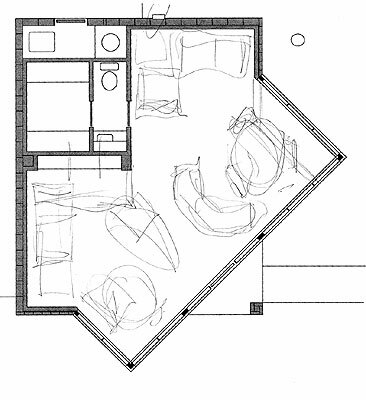 Overview: Concept from the minimalist Japanese. 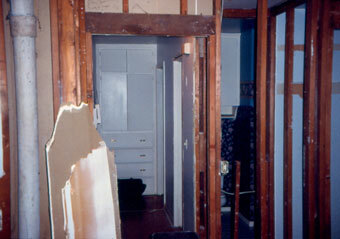 This large closet replaces several smaller closets and cabinets in the 1952 house. 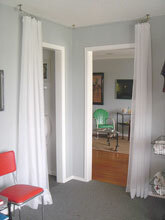 Shares a sliding door (representing barn doors) with the bathroom. 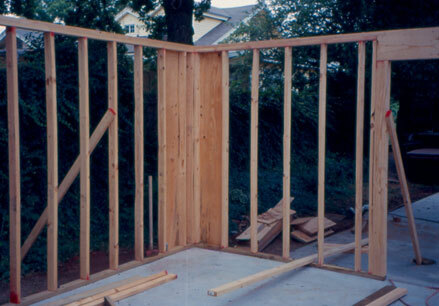 The custom shelves allow for long hanging garments. Lighting: Fixture mounted on the wall to better reach into the shelves rather than on the ceiling shining down onto the top shelf. 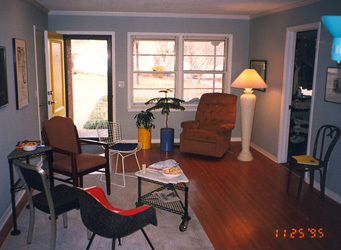 The living room is defined by the area rug and the collection of chairs. The best arrangement for visiting and conversing is to align seats at a 90 degree angle so that its easy to look at another person (unlike sitting side-by-side on a sofa) and easy to look away (unlike in chairs that face each other). Sofas make inefficient units for humans to comfortably converse. 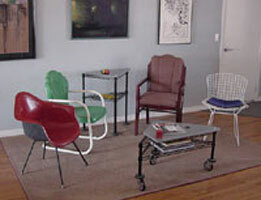 The individual chairs allow arrangement flexibility and are fun as guests select their favorite style of chair. 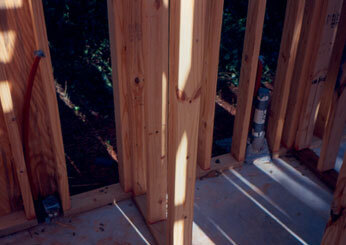 Some walls in the great room are sheathed in corrugated tin and at a 45 degree angle to the layout of the house. 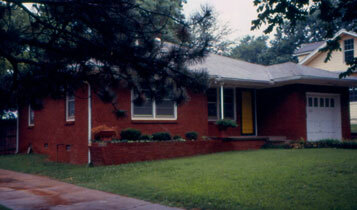 This represents rural Oklahoma twisted by a tornado and plopped down into the '50s ranch house. 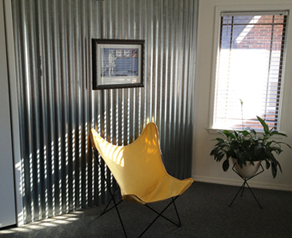 The angle of the chairs respects the angle of the corrugated tin walls while the rug respects the alignment of the foyer walls. 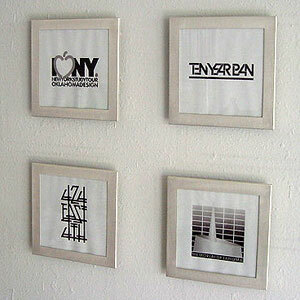 Blinds: Originally mini-blinds. 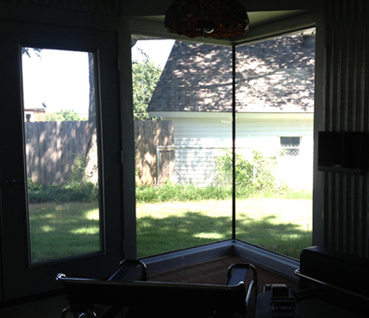 2012: 2" blinds throughout the house. 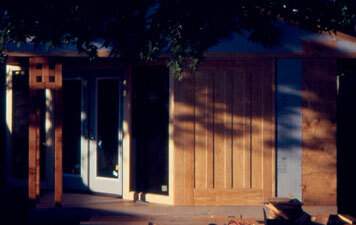 The wider slats are reminiscent of Jim's childhood home and create a dramatic plantation shutter pattern of sunlight inside the house. 2018: blackout solid pull-down blinds. 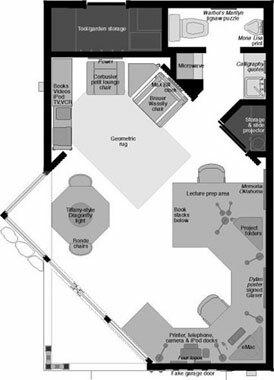 Overview: In the great room is a seating/reading area and, defined by the modular seating units, a media den. 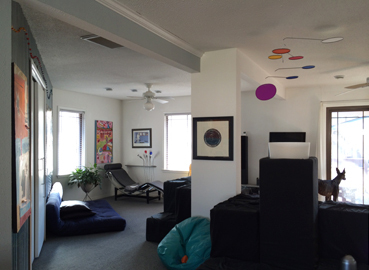 The TV and stereo are positioned to be seen or heard from anywhere in the great room. 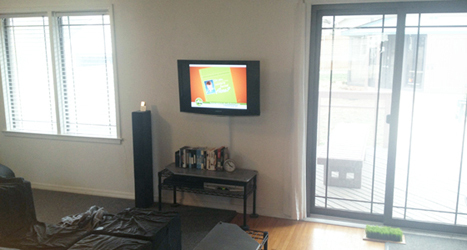 Purpose: Watching television, lounging, listening to music, and conversing with guests. 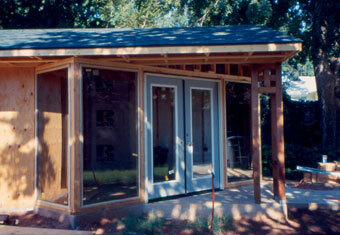 Created by a table positioned so diners can watch TV (which is on a swivel base) or look outside and enjoy the yard. Nearby is a closet for brooms and cleaning supplies. 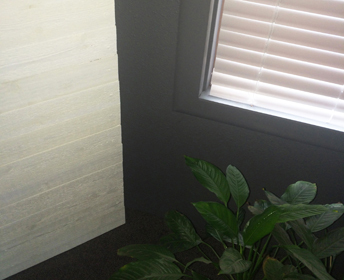 The door to this closet is hidden to minimize intrusion into the purity of the tin siding. 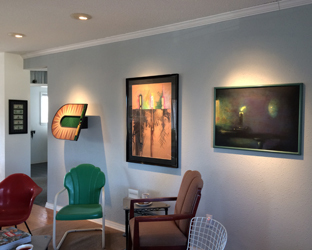 Lighting: A minimal and unobtrusive spotlite shines down on the table while another spotlite highlites the painting over the table. An all-white kitchen helps this space blend into the background when viewed from the great room. 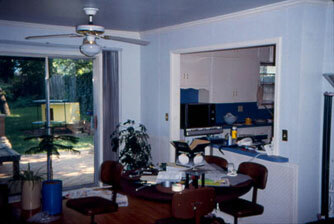 The entire kitchen was remodeled in the summer of 2002. 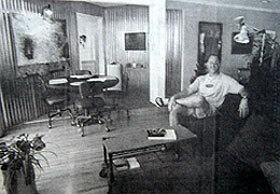 The inspiration was a couple of home furnishing stores in SoHo seen in March of 2002. 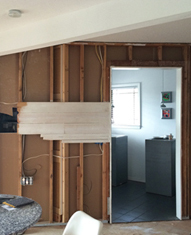 The concept is to not have cabinets and counters up against all the walls. 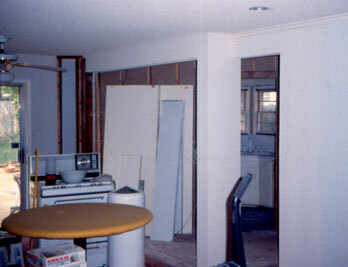 The main counter tops are pedestals that are floating in the room, away from the wall. The faucet set allows easy access with the high faucet, one-touch control, and built-in soap dispenser. 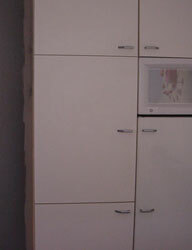 Storage in the cabinets that were removed is now accommodated by cabinets in the laundry room and new cabinets in the kitchen. 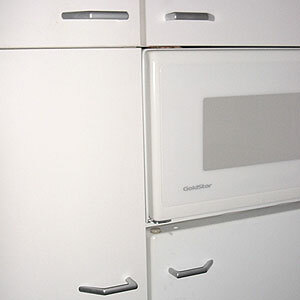 The appliances are hidden in the cabinet by the refrigerator. There is no dishwasher nor stove. 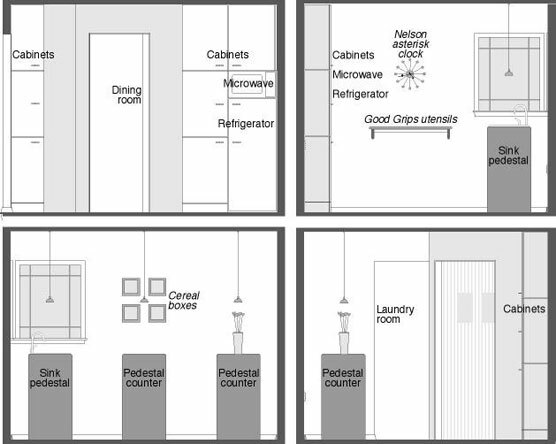 Those are unnecessary for a single tenant who is satisfied with a microwave oven. 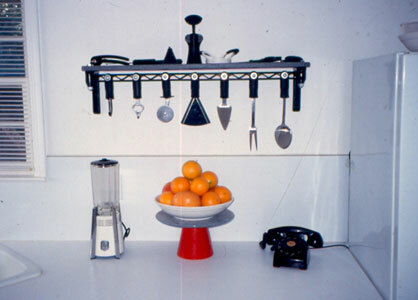 The minimal kitchen Remodeled in 2002, the kitchen is part of a 1,000 square foot 1952 house with classic furniture by Corbusier, Eames, Bertoia, and Saarinen. 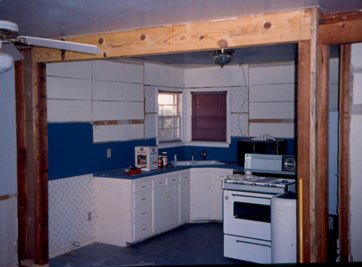 The concept of the kitchen is to not have cabinets and counters up against all the walls. 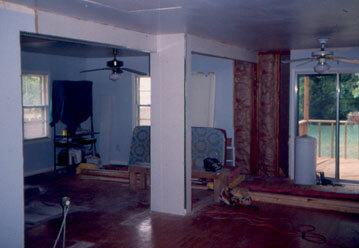 The main counter tops are pedestals that are floating in the room. 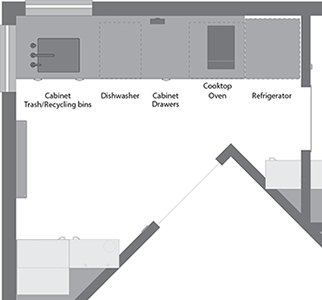 Storage is accommodated by new floor-to-ceiling cabinets with flush front microwave and refrigerator and new cabinets in the adjacent laundry room. 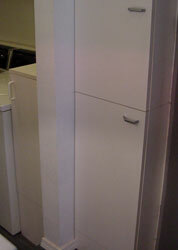 Smaller appliances are hidden inside one of the wall cabinets. 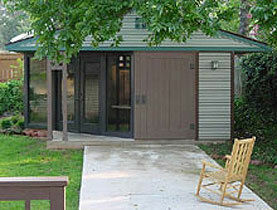 There is no dishwasher nor stove - those are unnecessary for a single tenant who doesn't cook much. 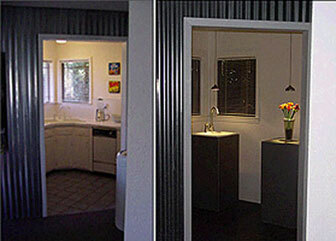 The minimalism reflects the owner's desire to live a simpler and less cluttered life. 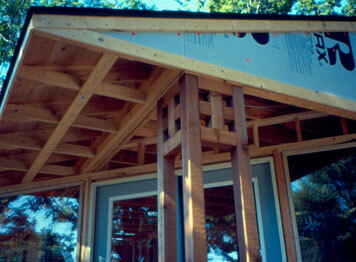 The exterior of the house has numerous Arts & Crafts details while the interior is contemporary industrial minimalism. 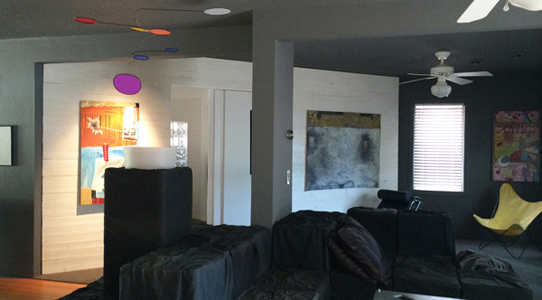 Lighting: Ceiling spotlites aimed on the wall to highlite the art. 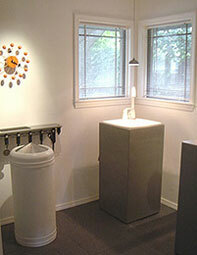 The hanging minimal fixtures over each pedestal are similar to fixtures designed at the Bauhaus in 1926. Clock: Orange Ball Clock by George Nelson (1908-1986), designed in the 1950s. 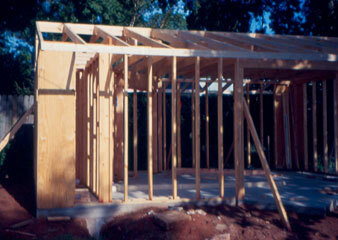 It typifies the spirit of the times - a firm belief in progress and a post-war economic boom. 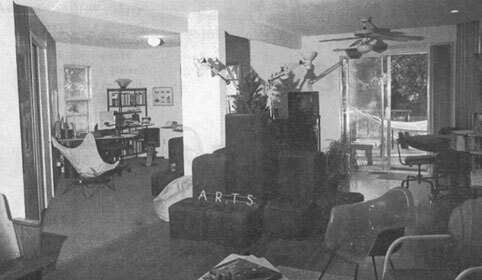 Nelson sought to bring modern design into the American home. Nelson felt that designers must be "aware of the consequences of their actions on people and society and thus cultivate a broad base of knowledge and understanding". 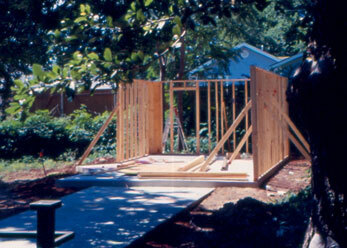 An early environmentalist, Nelson's ultimate goal as a designer was "to do much more with less." As Nelson tells it: "And there was one night when the ball clock got developed, which was one of the really funny evenings. 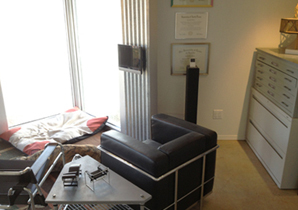 Isamu Noguchi came by, and Bucky Fuller came by. I'd been seeing a lot of Bucky those days, and here was I and Noguchi, who can't keep his hands off anything, you know - it is a marvelous, itchy thing he's got - he saw we were working on clocks and he started making doodles. Then Bucky sort of brushed Isamu aside. 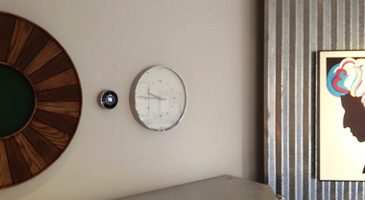 He said, "This is a good way to do a clock," and he made some utterly absurd thing. Everybody was taking a crack at this, pushing each other aside and making scribbles. At some point we left - we were suddenly all tired, and we'd had a little bit too much to drink. The next morning I came back, and here was this roll (of drafting paper), and I looked at it, and somewhere in this roll there was a ball clock. I don't know to this day who cooked it up. I know it wasn't me. I guessed that Isamu had probably done it because (he) has a genius for doing two stupid things and making something extraordinary, out of the combination, (or) it could have been an additive thing, but, anyway, we never knew." 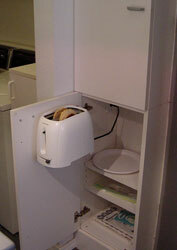 The toaster is attached to a cabinet door and swings out for access. 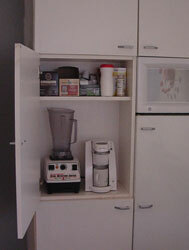 The blender and coffeemaker are inside another cabinet, hidden from view when the door is closed. 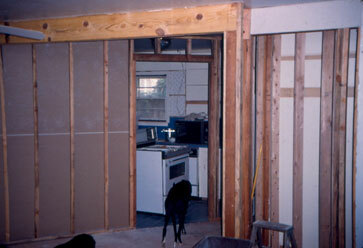 Electrical outlets were installed in each wall of cabinets. Laundry rooms were not common in 1952. 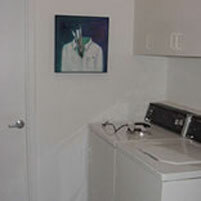 The dryer, previously to the left of the door has been moved to sit side-by-side with the washer. 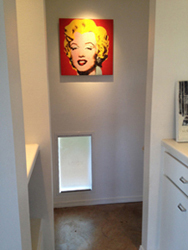 A built-in shallow storage cabinet was walled over and new overhead cabinets installed. 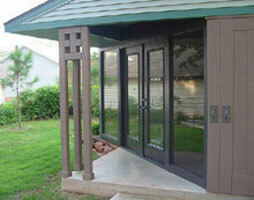 In the door to the outside is a smaller door for use by the canine residents. 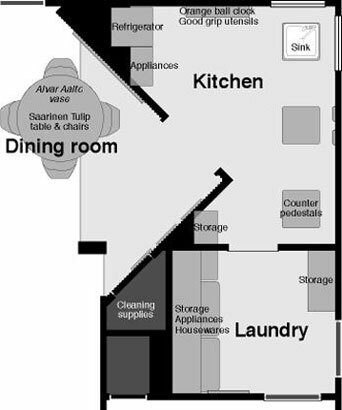 Purpose: Laundry units, dog feeding station, and storage. 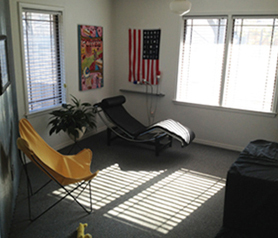 Overview: The clean orderly environment provides a smooth transition from the car to the house. 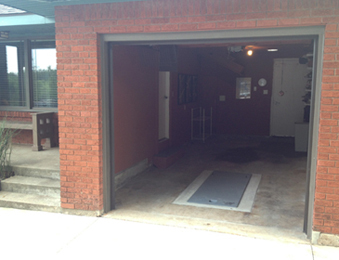 I painted the inside of the garage to match the brick color and creating a darker interior. 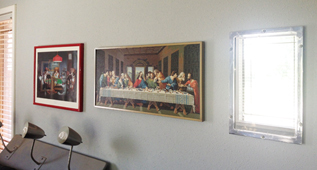 I removed the artwork (yes, I have art on the walls in the garage) towards the back so it would be less visible from the street. 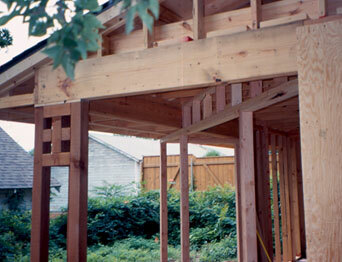 The goal was to minimize the prominence of an open garage when viewed from the street. 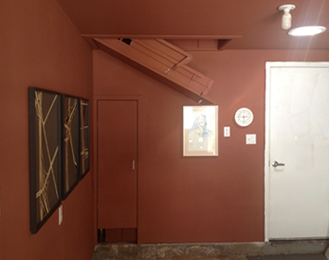 I even painted the pulldown attic stairs to be less obvious. 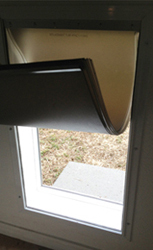 The in-the-door-mailbox swings up out of the way, so I installed this mail basket for the times when the door is up. 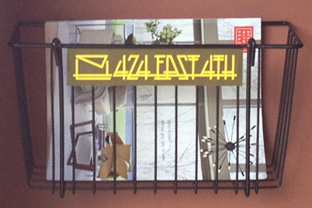 The style matches the address signs. 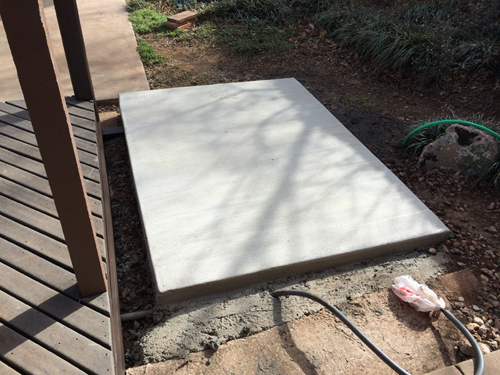 Floor: Concrete, area rug by the laundry room door. 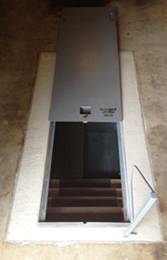 A storm shelter was installed in September, 2013, in response to a tornado that touched down 3 miles away in May. 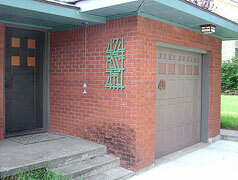 Walls: Grey paint until 2013, then brick color to match exterior so the groj looks like a carport when the door is left up during hot weather. 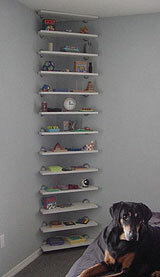 Furniture: Wall-mounted white shelves for tools, hardware, and storage. Left: the original farmstead with a house and barn. 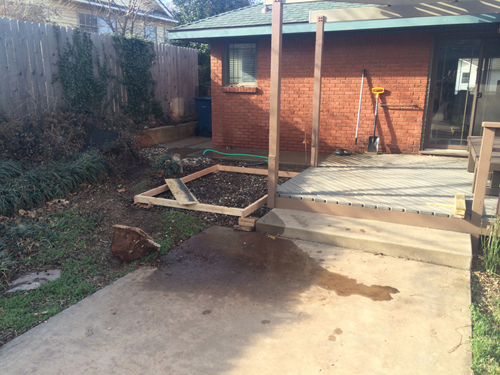 A dirt drive came up from the surveyed property edge. 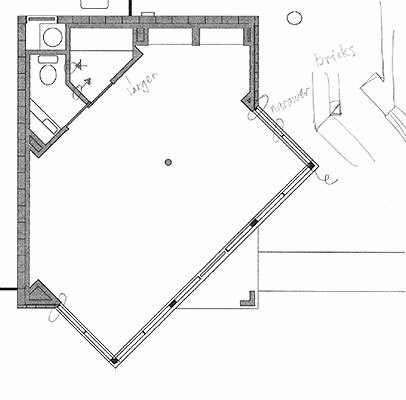 Middle: Once the homestead was divided into lots, the farmhouse sat on the second lot up from the3 boundary. 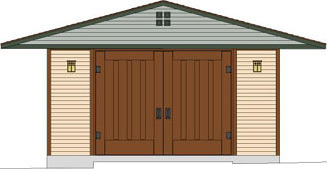 The now-unneeded barn was replaced by a single-car garage with storage area. 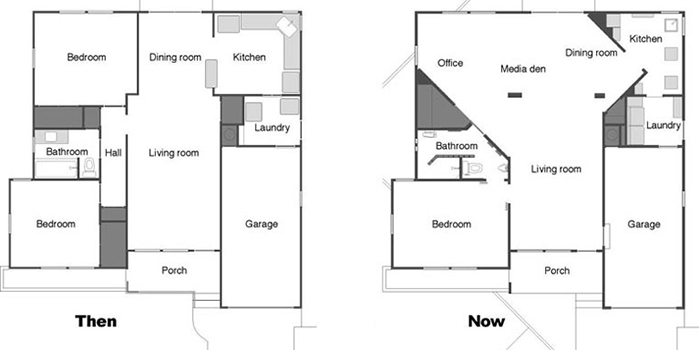 Right: The current house replace the old abandoned farmhouse and the garage was turned into an office. 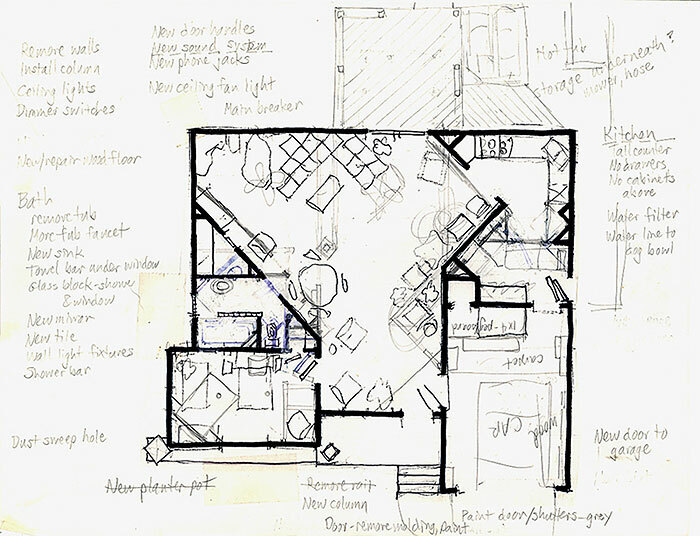 I saw the possibility for cutting out rooms and closets and creating the diagonal swath and sketched this renovation. 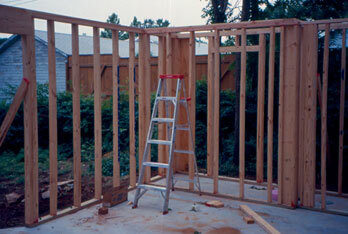 Knew I would remodel whatever house I moved in to. But, after I finished the semester, arranged stuff in house. 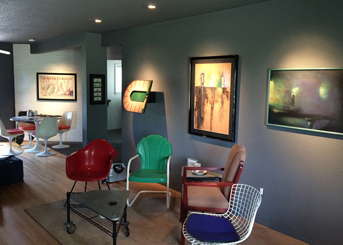 Liked the row of chairs in the dining room and the row of original artwork. 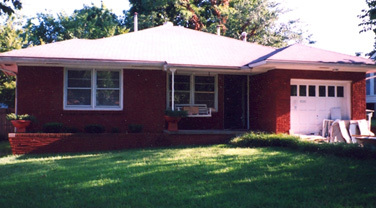 The house was built in 1952. 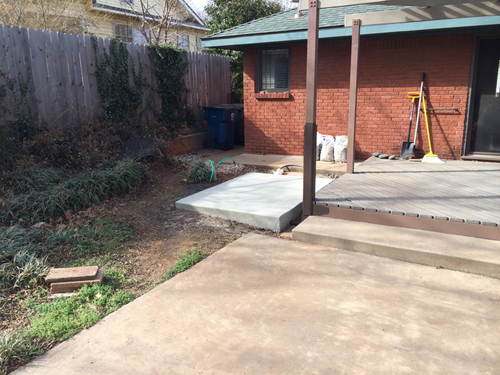 A previous resident put in sliding glass doors from the dining room to the backyard and poured some concrete steps and a small patio, put in a pass-thru counter between the dining room and kitchen, and built a wall in the garage to create a separate laundry room. 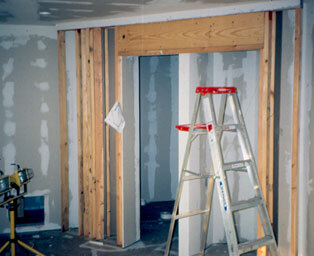 Began by cutting wall to install door to the carroom. 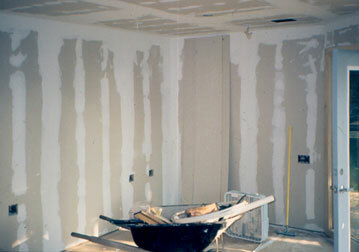 Whoa, lots of sheetrock dust. Sat down and questioned if I should be doing this. yes, I should. 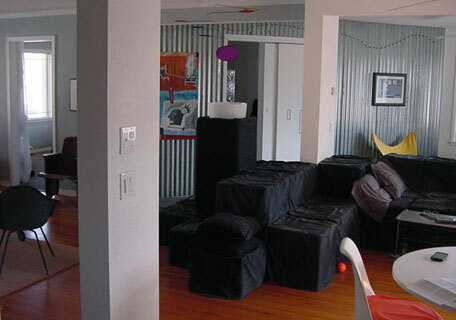 Watson was seeking the openness of a loft type space with a bit of industrial feel yet in a residential naborhood. 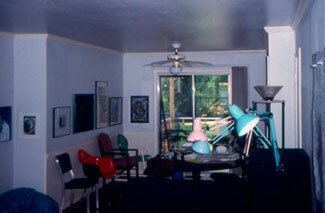 The interior of the house was completely remodeled during the summer of 1995 by Watson. 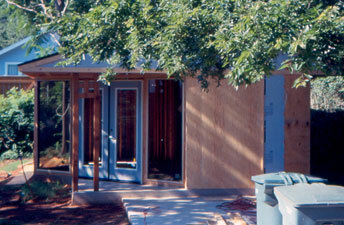 An office addition was designed by Watson and built during the summer of 2000; the new kitchen was designed and built during the summer of 2002. 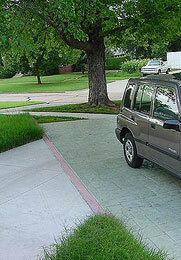 A new driveway with parking pad was designed and poured in winter 2004. 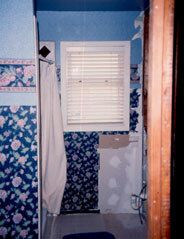 The bathroom was enlarged and remodeled in spring 2004. 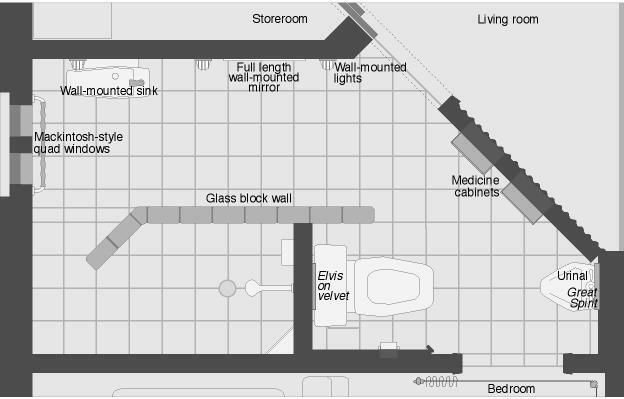 The Japanese state that a 'home is neat and orderly with things not immediately in use being stored out of sight.' 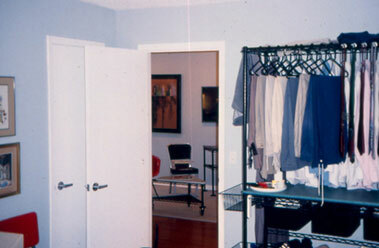 They use a large storeroom rather than multiple smaller closets. 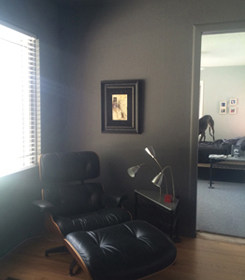 • Minimalism - Watson is a minimalist: he prefers spaces simple and uncluttered. Ridding one's environment of clutter (or never letting it in) is quite liberating - it frees the mind from petty trappings. 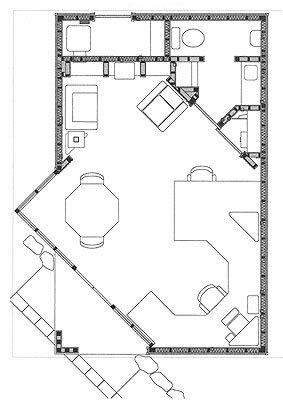 • The rooms at the front of the house: groj, foyer, living area, and bedroom have grey painted walls; all angled walls are corrugated tin, all other walls are painted white. 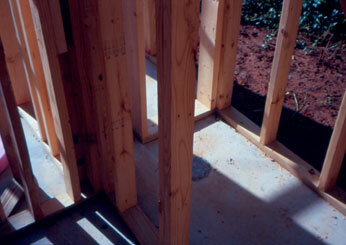 The tin walls are at a 45 degree angle to the layout of the house. 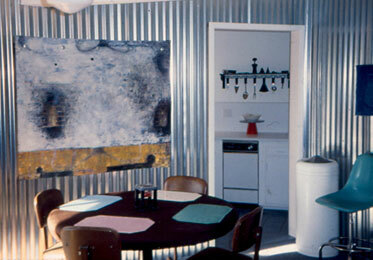 This represents rural Oklahoma twisted by a tornado and plopped down into the '50s ranch house. 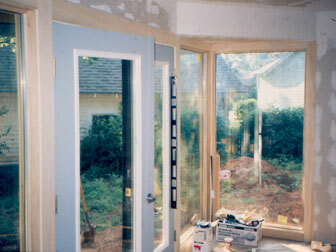 • Windows in the house are picture windows with Craftsman/Mission detailing grids. 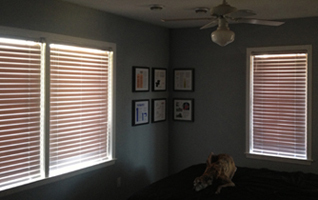 • Window blinds throughout the house are 2" white mini-blinds - simple, clean lines, and unobtrusive. 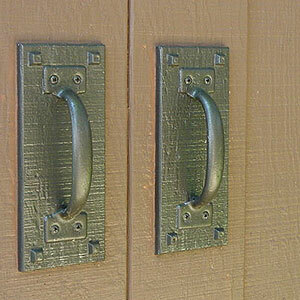 • Door handles in the house and office are lever style for easier operation, especially when hands are full or wet. 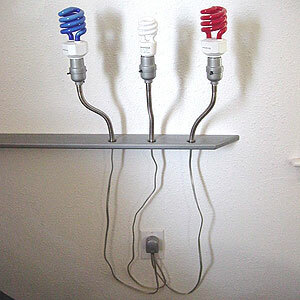 • Electrical outlets and switches in the house and office are the flat Decora style, some are dimmers and some are illuminated for easy locating at night. 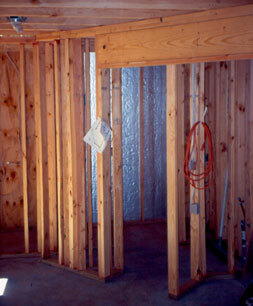 • All water control valves in the house and office are single lever. • Arrangements of picture in Arts & Crafts quad compositions. 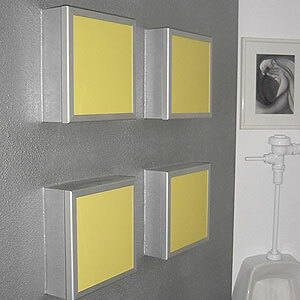 • Horizontal sets of 3 items (pictures, desk lights, light fixtures). • Seating units align with the height of the dining/end tables and the coffee tables. 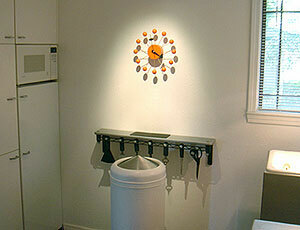 • Fixtures in the bathroom: faucet, coat hook, soap dish, etc, align. 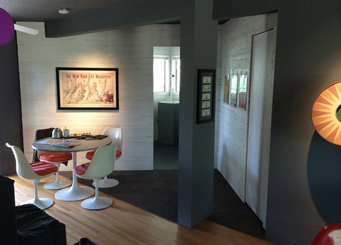 • Angled cut corners of table tops align with other features in that room. 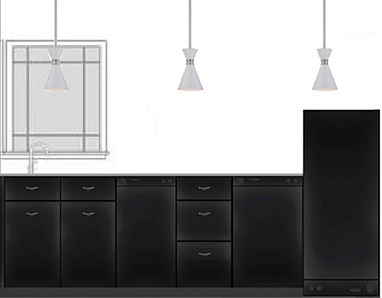 • Kitchen pedestals align with windows. FLW Disney, never finished. 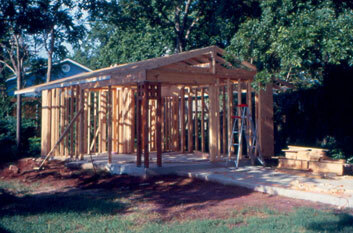 laboratory, workshop for new ideas. The logotype for the house is a type treatment that respects the lettering and typography of Arts & Crafts: double horizontal bars and arms in the letterforms, angles that align with other elements, straight horizontal baselines, and individual elements forming a single cohesive unit. 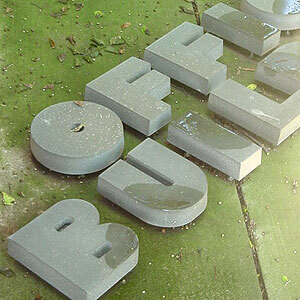 The letterforms are created as original elements to respect each other and their position within the rectangle shape. 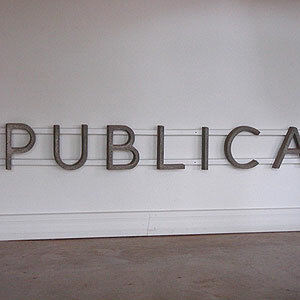 The stacked words allow the 424 at the top to be prominent. 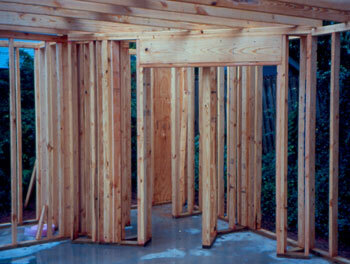 The vertical lines align and run through each line of type conveying the unity and strength within the house. 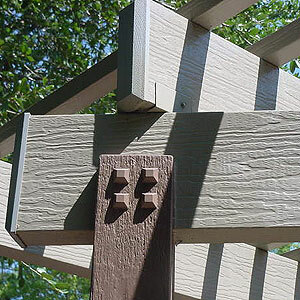 This logomark (above right) is a juxtaposition of a diamond and four squares. 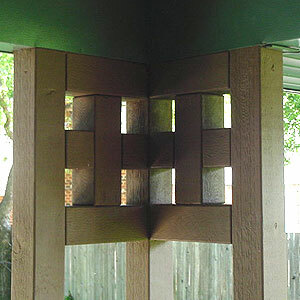 The four squares are a pattern popularized by the Scottish Art & Crafts designer, Charles Rennie Mackintosh. 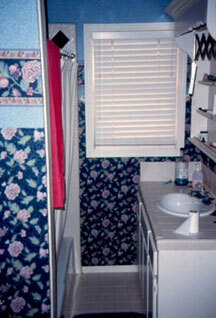 This pattern is found throughout the house - picture arrangements, bathroom windows, and porch columns. 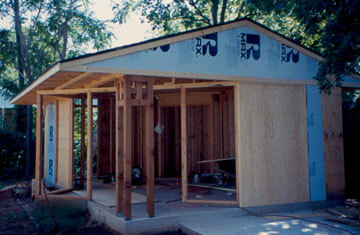 The diamond represents the walls within the house that are turned at a 45 degree angle to the basic house grid. 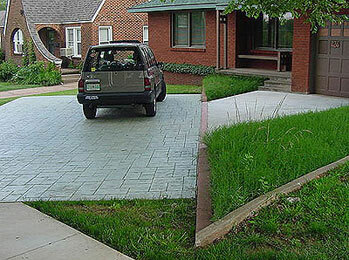 The house is designed on a theme of these two overlapping grids. 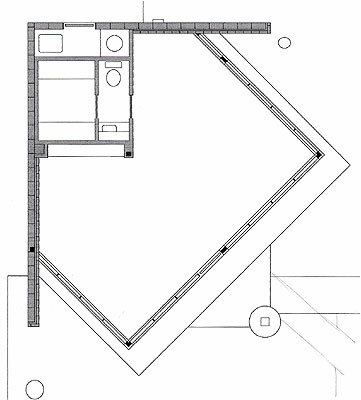 The black shapes form 4 arrows spreading out in 4 directions - to represent the open spaces within the house and the fact that one can stand inside the house and look out a window in all four directions. 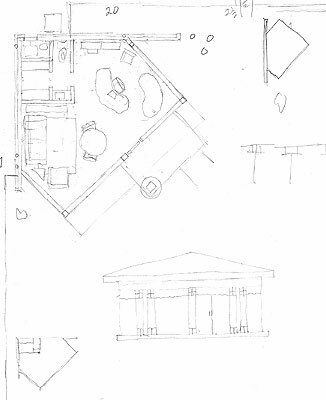 Below are sketches of the office in the back yard. 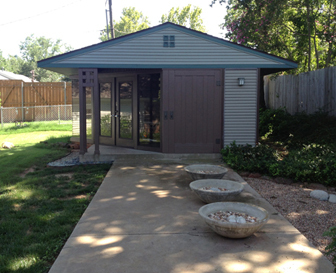 It started as a Miesian Bauhaus-like structure with a flat roof and evolved to a free-standing garage structure remodeled into an office. 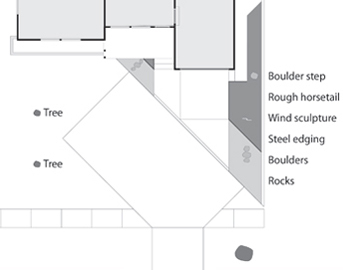 The sketches above were explorations of developing a nature trail environment to connect the existing house to the new office in the back yard. 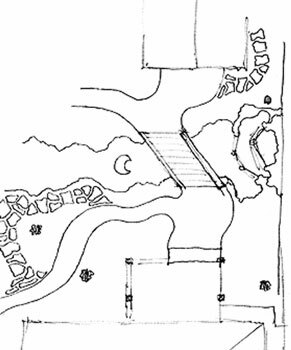 Features: undulating paths, waterfall, pond, and stream, and a bridge across the stream. 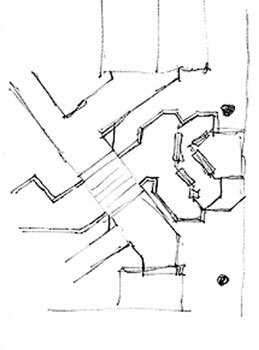 The sketch on the right uses only geometric orthogonal lines. 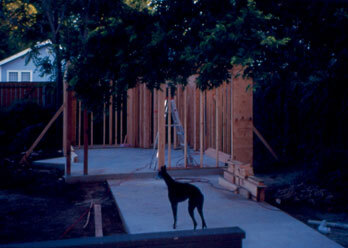 Neither have been realized and probably won't - too much expense and work for the small lot. But it was fun playing with these options. 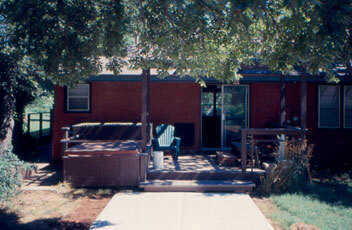 At the top is the office connected to the house by the wide sidewalk. 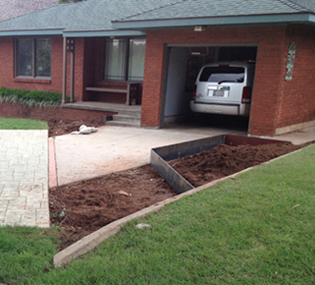 The rear deck and hot tub are next, then the house, and the new driveway and angled parking pad. 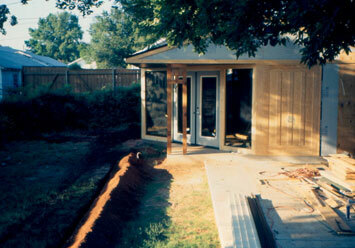 The landscaping curb zigzags through the yard to connect the office to the main house and continues through the house to the front sidewalk. 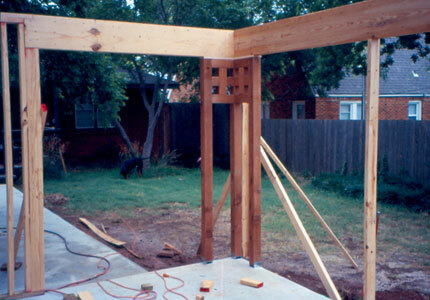 The angled pergola and parking slab respect the angles inside the house and office. 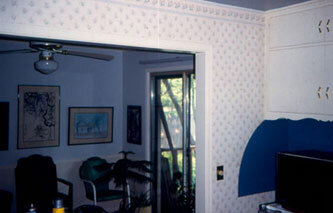 When I moved in, the front porch was hemmed in by wrought iron railing and the trim and groj door were painted white. 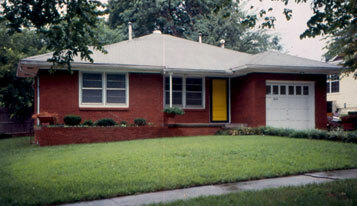 The railing was removed within hours of moving in and the white groj door against the dark brick made it the focal point of the house curb appeal. 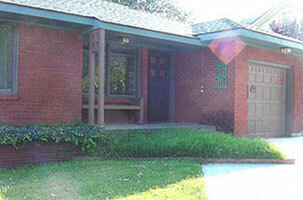 The front of the house was renovated in 1995 in a style reminiscent of National Park Arts & Crafts. 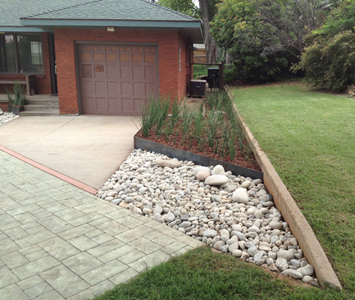 The brick planter uses roman style bricks, noted for their long thin shape and used extensively by Frank Lloyd Wright to convey a low horizontal prairie style. 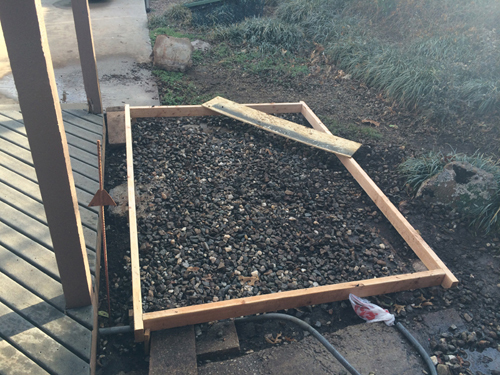 The unique angle at the end of the planter was disguised by a bush, cut down soon after moving in. 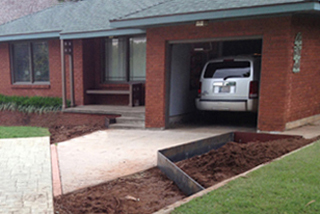 To enhance the horizontalness of the planter, shutters and the porch railings were removed and broad-bowl planters were placed at the extreme corners to draw one's eye to the side extremes. 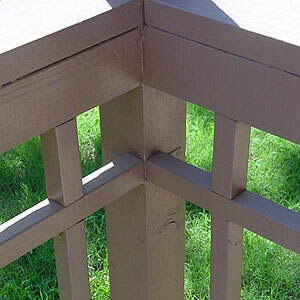 The Mission Craftsman style influence is in the column and porch bench detailing, the colors of brown and green, the accent color of copper, and the simplicity of the 4x4 posts. The front door is detailed in an Arts & Crafts style with faux copper windows to establish a focal point from the street and invite guests inside with its warm color. 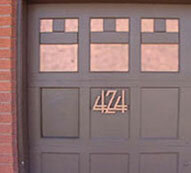 The mail slot is hidden in the groj door to minimize embellishments on the front of the house - the panel to the left of the numbers swings in. 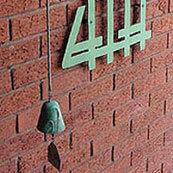 The bell hanging by the address sign is from Arcosanti, Paolo Soleri's experimental architectural community north of Phoenix. Address signs: On each side of the garage is a metal sculptural address sign. The lettering was designed in an Arts & Crafts style. 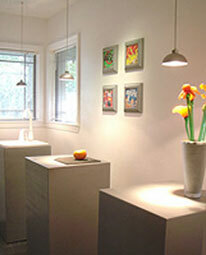 Lighting: classic Arts & Crafts detailing. 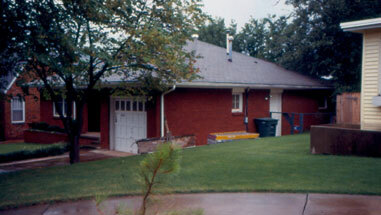 In 2004, the 1952 driveway was removed and replaced with a larger one that provides space for parking in front of the house. 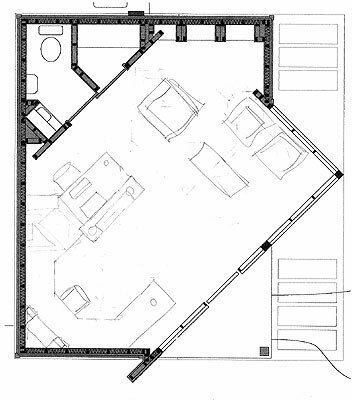 The parking pad is angled to relate to the angled great room inside and provides a subtle intro to the angles the visitor is about to encounter in the house and office. 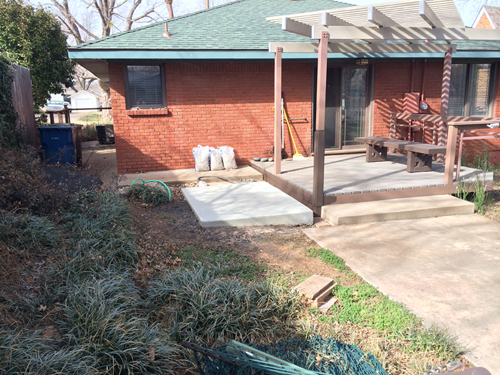 The pad is stamped and stained concrete to soften the harshness of so much concrete in the yard. 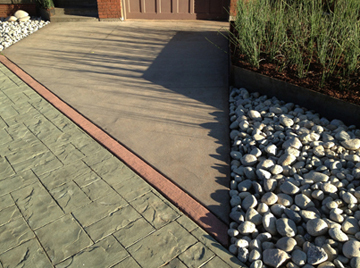 I had wanted to do something special to the planting beds on either side of the driveway. 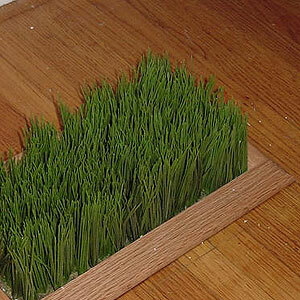 First, I just let the grass grow tall (see foto above). 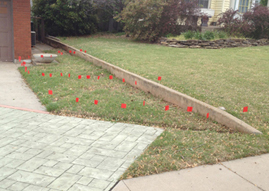 But, that wasn't special enough - there needed to be a more intriguing look to the front yard. 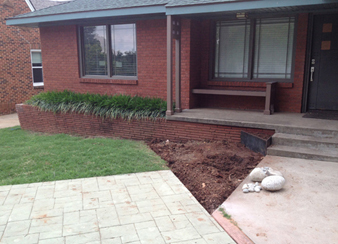 During the purge of the Project List in spring/summer of 2013, I hired a landscaper to implement a new look. I gave some other criteria: low maintenance, few droppings from the trees (no acorns, seeds, etc.) and low water usage. 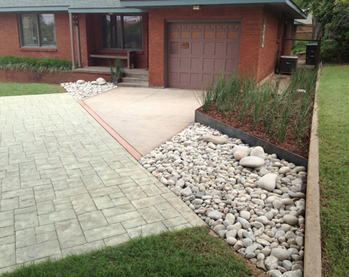 Xeriscaping is the art of planting that doesn't require much water. Xeri means dry. 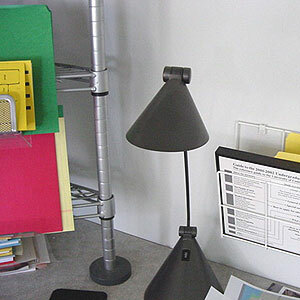 The Haloid Company developed a dry process for photocopying and renamed their company to reflect that - Xerox. 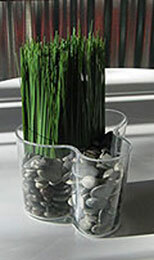 • I saw some rough horsetail at a friend's house and liked the way they grew tall, straight, and dense. 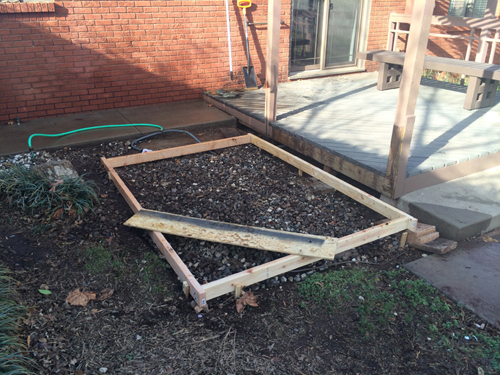 That filled the steel-edged beds. 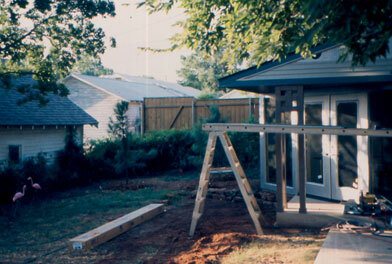 The small triangular bed by the steps forms a visual 'handrail' and helps frame the steps and accent the porch. 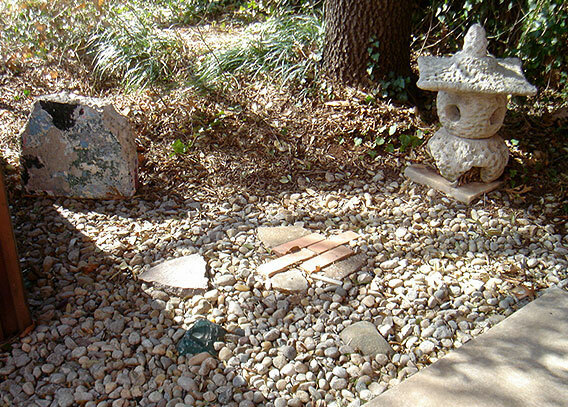 • I also liked the look of smooth river rocks. 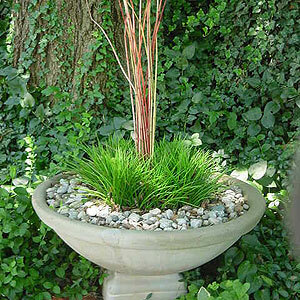 • For a kinetic focal point, there is a wind sculpture in the large bed of horsetail. I selected an option that had references to a windmill from the Oklahoma prairie and dandelion flowers. 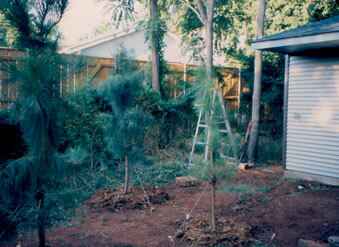 • Three cypress trees - two in front and one in back - were planted in alignment with the parking pad and the side of the house. The notion of a bench under the big tree had floated around for several years, but not strongly enough to do anything about it. Then 2 factors changed - I gave up trying to grow grass under the shaded tree and I was waiting for an Uber ride and wished I had a place to sit down. 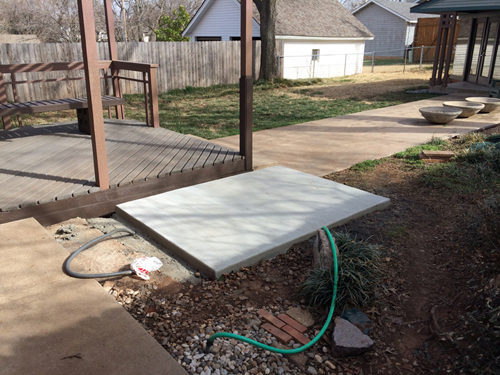 I needed a bench. I looked at some bench options online and was exploring a NYC park bench like those I sat on every evening along the Hudson River. But, the downside to such a bench is that it looks lonely when empty and this bench would sit empty about 99.9% of daylight hours. Not sure from where the inspiration came - but a boulder could serve as a bench and look sculptural and natural when empty. I went to a rock store in Midwest City and the owner drove me around in a golf cart so I could see the many boulder options. 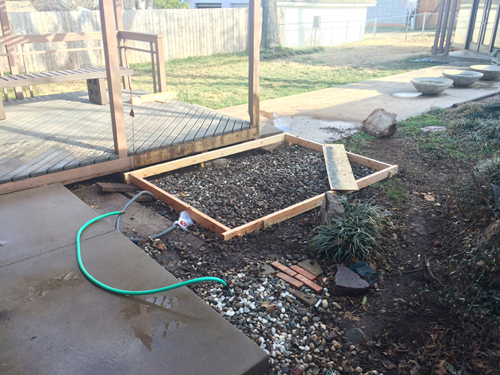 I picked 3 rocks and they were delivered and positioned 2 days later. 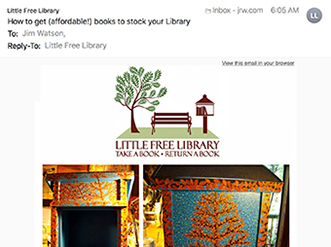 Below: a bookmark I designed to explain the Little Free Library concept. I place one in each book and leave some in the library for people to take who want more information. 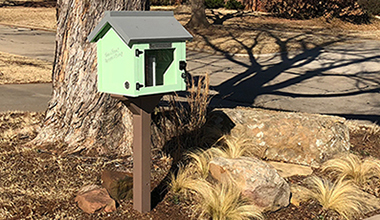 Little Free Library is a nonprofit organization that aims to inspire a love of reading, build community, and spark creativity by fostering naborhood book exchanges. 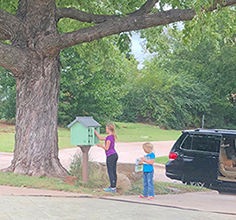 Through Little Free Libraries, in all 50 states and over 80 countries, millions of books are exchanged each year. 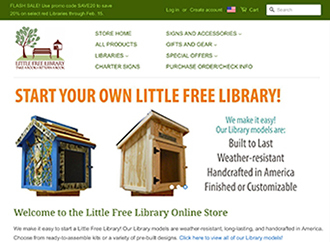 Library website. Anyone passing by can take a book to read or leave one for someone else to find. 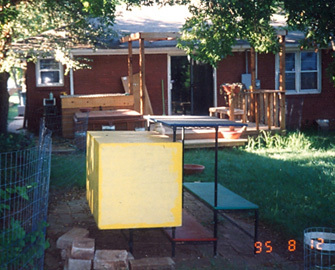 The organization relies on volunteers, known as stewards, to construct, install, and maintain book exchange boxes. 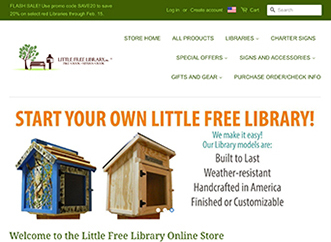 Libraries are listed on the Little Free Library World Map. 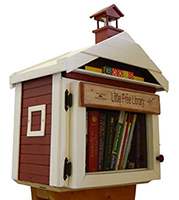 The first Little Free Library was built in 2009 by Todd Bol in Hudson, Wisconsin. 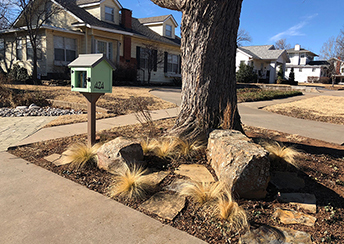 He mounted a wooden container designed to look like a one-room schoolhouse (above) on a post on his lawn and filled it with books as a tribute to his mother, who was a book lover and school teacher. 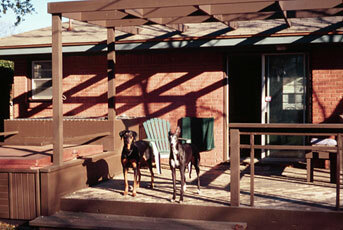 Bol shared his idea with his partner, Rick Brooks, and the idea spread rapidly, soon becoming a global sensation. 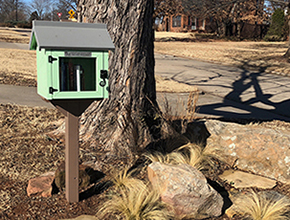 The original goal was the creation of 2,150 Little Libraries, which would surpass the number of libraries founded by Andrew Carnegie. 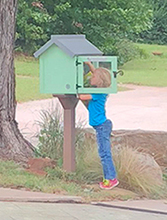 As of November 2016, there were 50,000 registered Little Free Libraries worldwide. 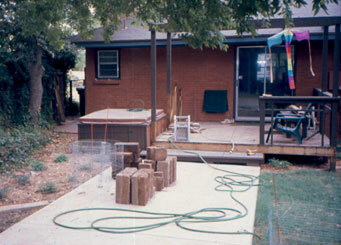 The left photo shows the original grid canopy and the hot tub and low tool shed that was added in 1995. 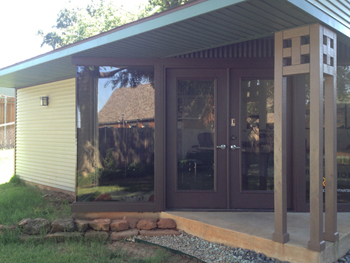 The new deck canopy/pergola is at the same angle as the tin walls and detailing picks up the Arts & Crafts style from the front porch. 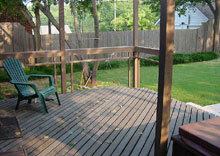 The deck floorboards are loosely spaced TrexDeck that never needs painting or sealing. 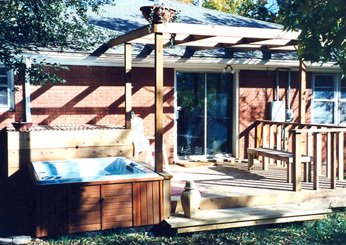 The hot tub provides a resort oasis with views of the trees and office. 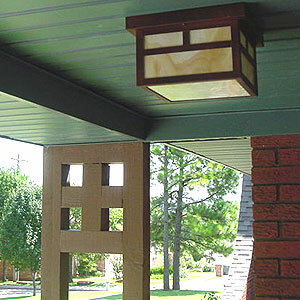 Lighting: the deck light matches the Arts & Crafts style light on the front porch. 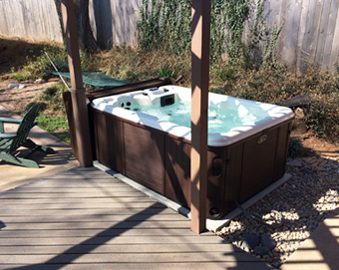 In 2014, while remodeling the interior and after reworking the exterior the previous summer, I ordered a new hot tub. 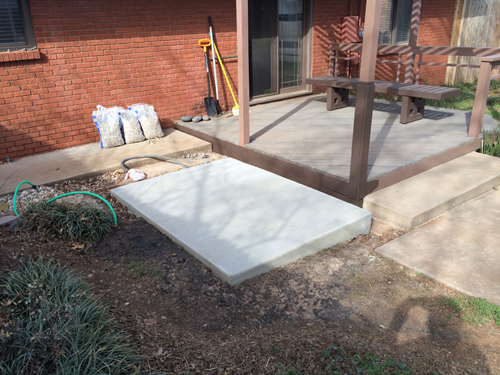 First, I had to get rid of the old one, above, and pour a new concrete slab. 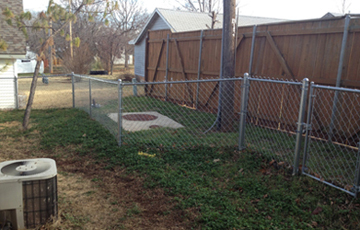 In 2012, the temporary (for 15 years) wire mesh fence was torn out and replaced with a classic chain link fence. 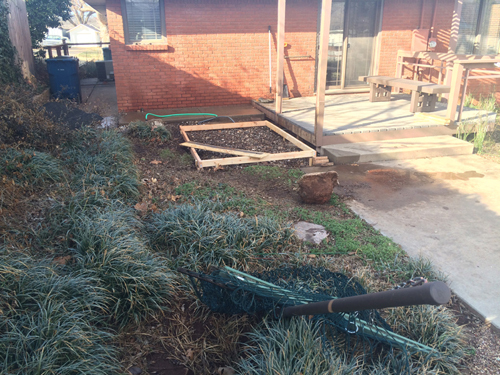 The old fence had been staked, meshed, and supported with junk to improve its barrier. 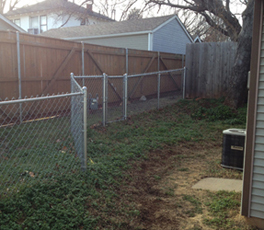 Both Vegas and Brooklyn had found weaknesses in that fence. 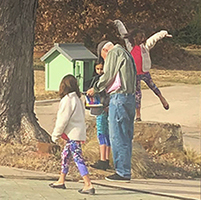 The chain link is reminiscent of the fences from Jim's childhood, that surrounded the schoolyards and playgrounds at Preston Hollow and George B. Dealey. 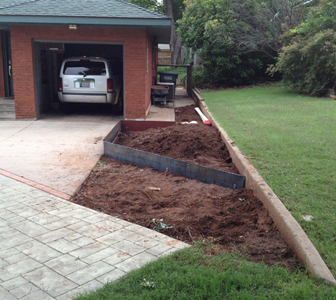 The fence angles in 2 places to better follow the terrain and to respect the angle in the house, office, and parking pad. The far corner of the backyard is home to 2 pine trees - the sound of the Oklahoma wind whistling through pine needles is a reminder of Watson's trips through Colorado and New Mexico. 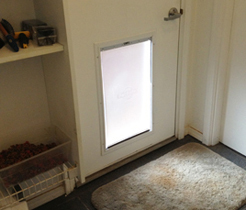 Left: The exit of the dog door installed in 2012. 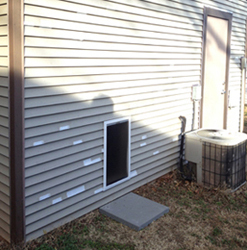 The siding shows hail damage - the siding was replaced soon after. 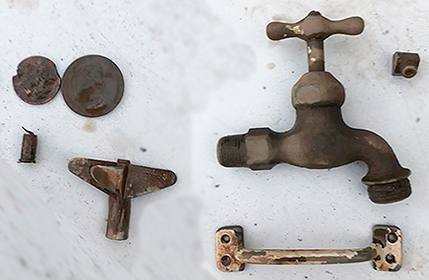 Right: A treasure hunter searched the yard and found these objects. Wish they could tell us their stories. 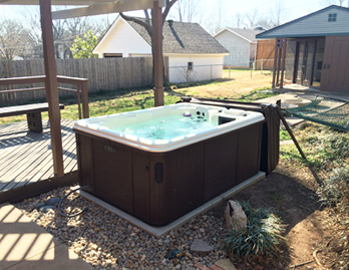 A severe drought and weeks of 100 degree temps settled into Oklahoma in 2011. Hopefully, we thought, it was just a fluke. But, then in 2012, there was another scorching summer. We will need to adapt. In the heat, I would leave the groj door up to let the car cool off in the shade. 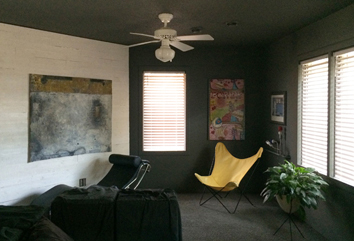 I had an exhaust fan installed and, so the groj would resemble a carport, I painted the inside of the garage to match the brick color and create a darker interior. 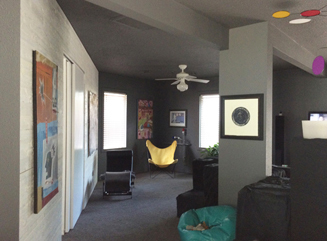 I removed the artwork (yes, I have art on the walls in the garage) towards the back so it would be less visible from the street. 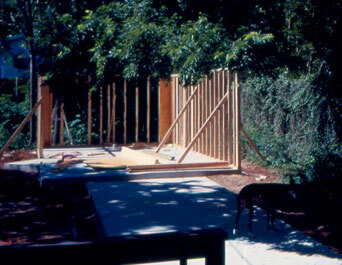 The goal was to minimize the prominence of an open garage when viewed from the street. 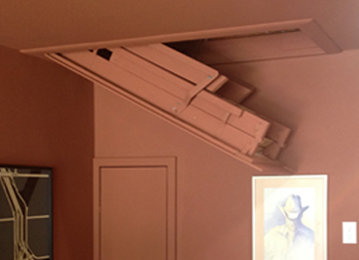 I even painted the pulldown attic stairs to be less obvious (I would sometimes open the stair door to let go up into the attic and out the attic vent). Spring of 2013 was a severe tornado season. One got close to my house. Laying on the floor of the closet, checking the weather app, and getting texts from friends about where the tornado was - that was one of the scariest moments I've experienced. 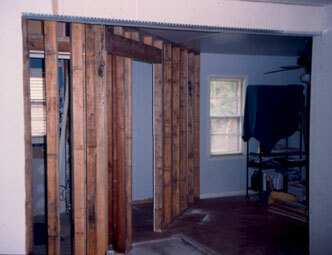 I realized that if a tornado hit my house, 2x4 wood and sheetrock wouldn't quite save me. 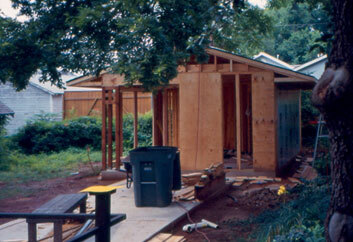 I had thought it about many times, during spring tornado season, but never committed to doing it. "Oh, I'll be alright." But that spring was different. 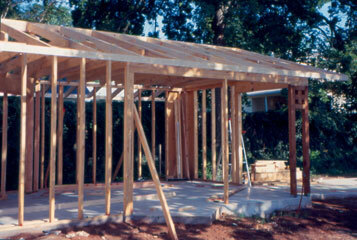 There were offers of basements down the block, but I figured it was time to get a shelter in the garage. 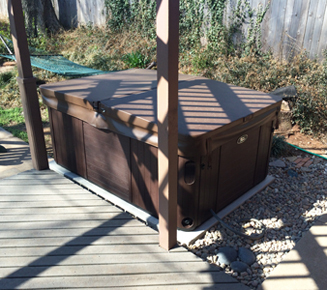 I ordered it in May, 2013, and it was installed on Tuesday, September 10, 2013. 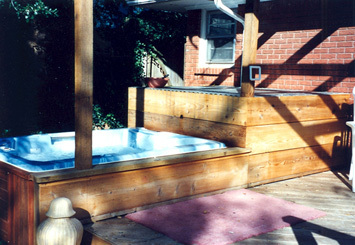 The tub, from Family Leisure, was a disaster - scraped side walls, no pump, electrical panel not wired up, old caked chemicals, no usewrs manual. I sold it after about 2 years and bought one online. It is working much better. 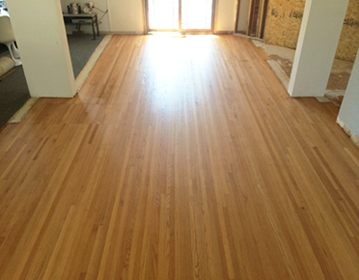 Above: The floor, before and after refinishing. 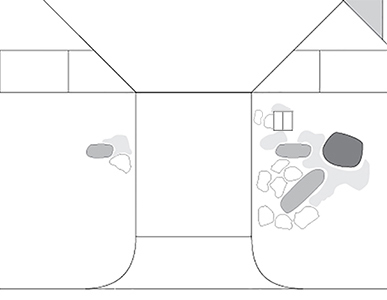 Below: some test sections to explore the grey color and the width of the white planks. 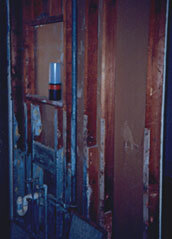 The exposed walls are where the corrugated tin was mounted. 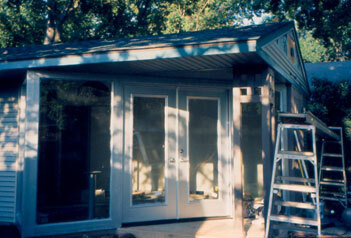 I had been in the house for 19 years; it was time to refresh and try some new colors and materials. 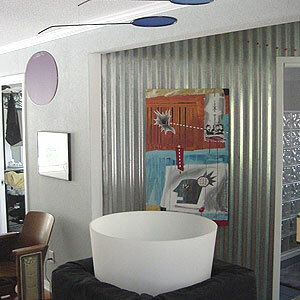 One advantage to owning a house is that it can serve as an experimental lab for design. 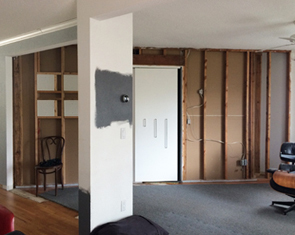 In 2014, I began a massive overhaul. It was time for some simplifying and I had some new ideas I wanted to implement. 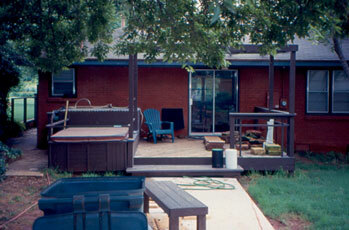 I still wanted to maintain the concepts of sleek contemporary mixed with rural Oklahoma. 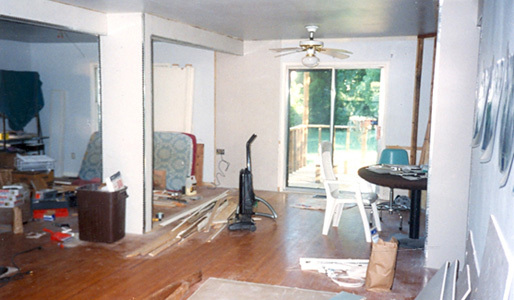 Changes: all the baseboards have been removed (walls now go right down to the floor); doors and windows were framed with simple slats with less detail; walls and ceiling painted Pantone Charcoal Grey; corrugated tin on the angled walls has been removed and replaced by rough cedar planks painted white; wood floors were refinished to lighten the color; new carpet tiles replaced.and the industrial carpeting has been replaced with Flor carpet tiles. 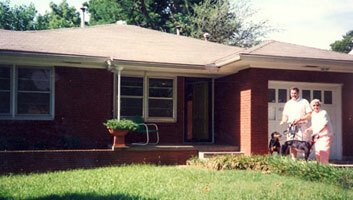 Below: house before the makeover. 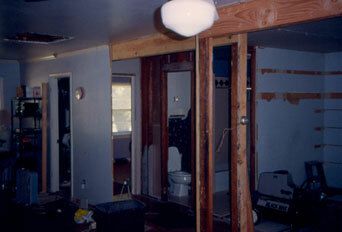 Photos below show the current remodeled condition. 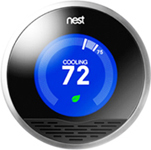 Put in these new digital learning thermostats in August 2012 in both the house and the office. 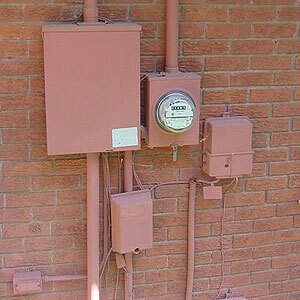 Simple to operate and they monitor energy use. 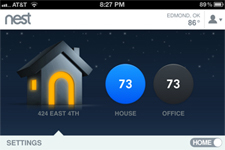 I can control both thermostats anywhere from my phone or pad. 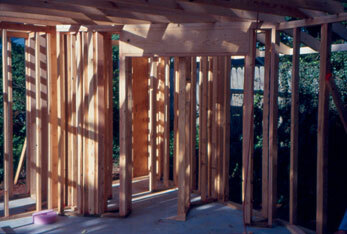 Installation was easy - the manuals and website videos were very clear and easy to follow. A first class product: great attention to detail and very well thought-out. Check it out here. 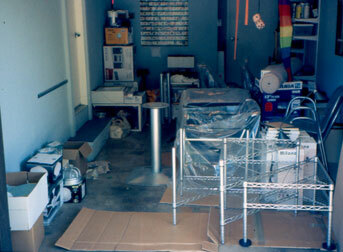 After I retired in spring of 2009 and decided to no longer teach studio courses (I continue to teach the history lecture course), I conducted a major purge of stuff in both Oklahoma and New York. I did a major purge of every closet, cabinet, and room in the house. 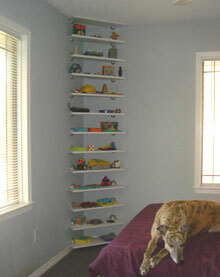 • Corner shelves in bedroom - I donated all the puzzles and mind games to a school teacher to use in her classroom. 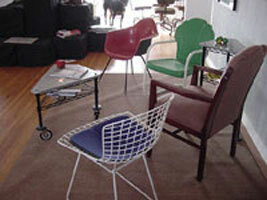 • Aluminum chair in the bedroom - kept the red one, there is just no need for 2 chairs in the bedroom. 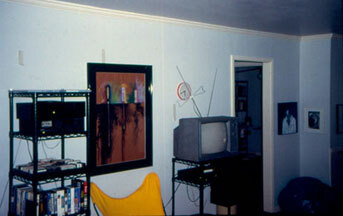 • Reduced size of entertainment center - purged videotapes and downsized the shelving unit that holds the television. 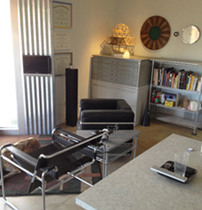 • Home office desk and chair - I moved the office functions to the main office in the back of the lot. • Book case in home office - moved most of the books to the shelves in the back office. 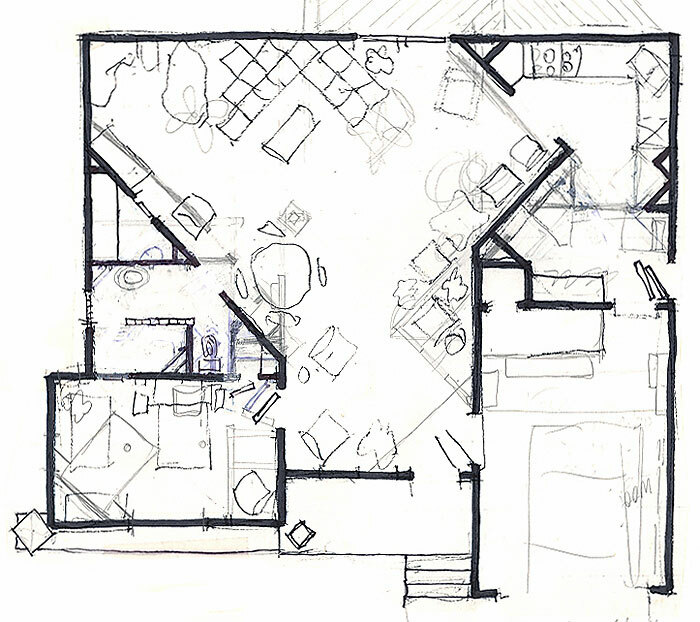 Angie and John, the cameraman, filmed the house on Friday, June 22 from 10am to almost 1pm. 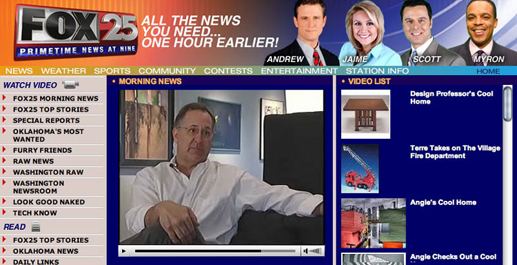 The two-minute segment on the morning news show covered the location and some of the background to my buying the house. 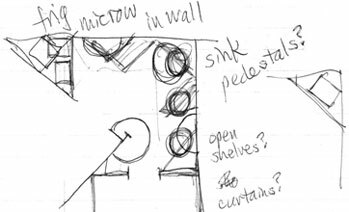 Images were of the kitchen pedestals, the seating units, living room chairs, bedroom nitestand lite switch, and the office. 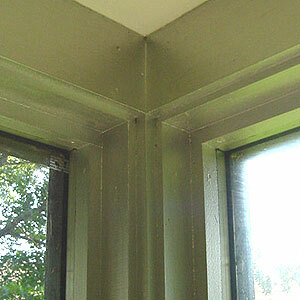 Was Frank Lloyd Wright or wrong? 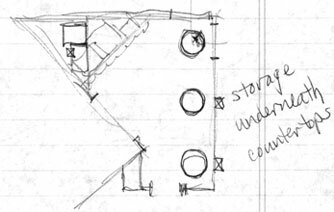 The noted architect was absolutely right as far as an Edmond Design professor is concerned. 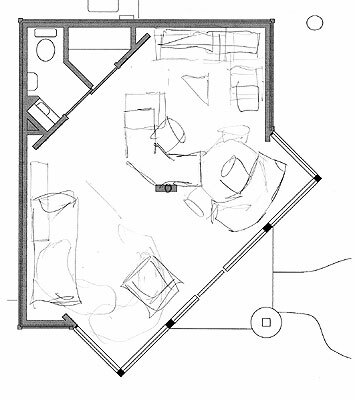 Jim Watson, professor of design at the University of Central Oklahoma, has redesigned his home to reflect modern European and Japanese minimalism and Wright's philosophies. 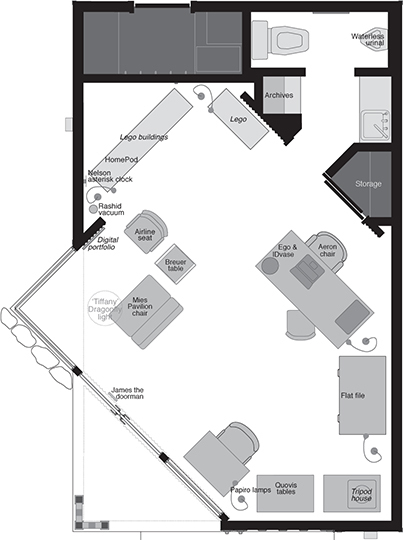 "These philosophies are," Watson said, "open spaces revolving around a central core, furniture built appropriate for the space and the open floor plan with room areas that flow into one another." 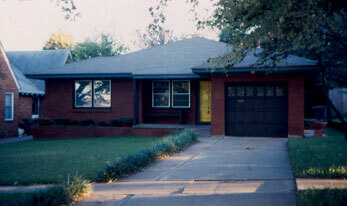 Watson bought the house, 424 East 4th Street in Edmond, in 1995 and then spent "six weeks of pure hell" in remodeling projects. 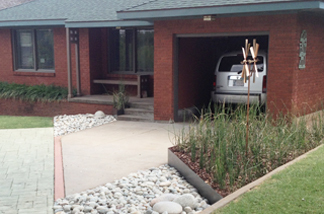 The result is a house interior that perhaps is the most modern and functional in Edmond. 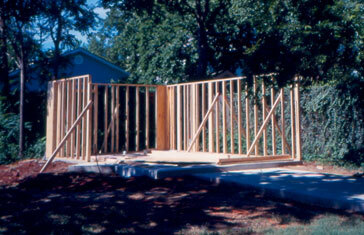 • A pet peeve is making beds; he built one that requires merely a quick spread of a cover. • He doesn't like to search through closets of open and shut doors, so his bedroom has a closet on wheels with everything exposed to view. • Hallways are a waste of space, he believes, so he eliminated them. 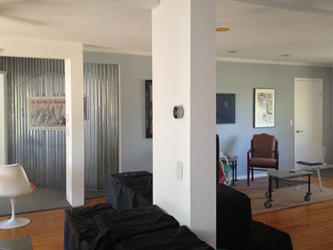 • Horizontal surfaces collect 'stuff'. He did away with most of those. 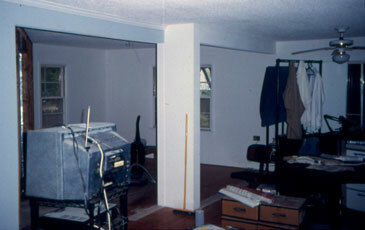 In gutting the house, Watson and the workmen he hired created a great room that contains a living area defined by the carpet and collection of chairs, an office area, a den/media area, and a dining room. 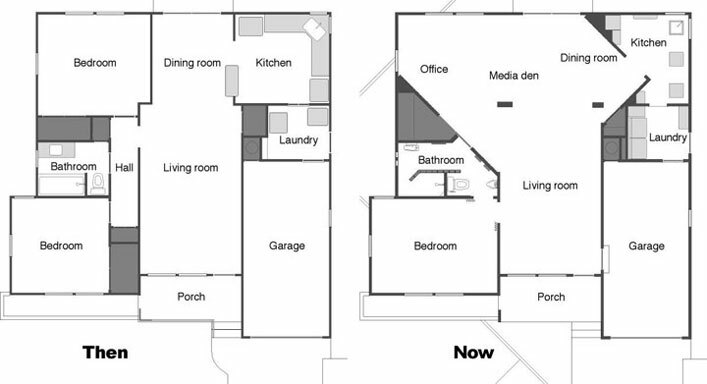 To gain the needed space, he eliminated one of the two bedrooms in the 1,080 square-foot house and reduced the kitchen size. Don't look for a sofa. Watson thinks they make inefficient units for humans to converse comfortably, so he has chairs in several different styles. 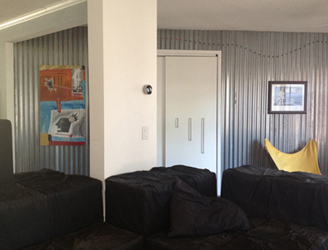 Some walls in the great room are of corrugated tin at a 45-degree angle to the layout of the house. "This represents rural Oklahoma twisted by a prairie tornado plopped down into the 50s ranch house," Watson said. 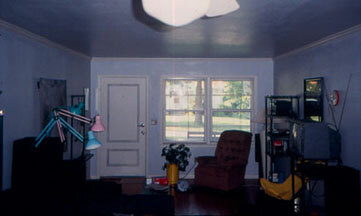 Other rooms in the house are grey or white. 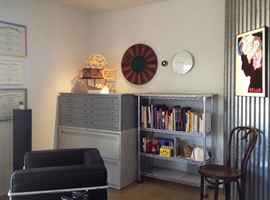 The office corner of the great room contains industrial shelving with table and desktops of faux stone. 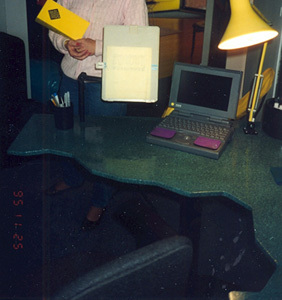 A workstation contains an iBook laptop, file cabinet, and digital answering machine. 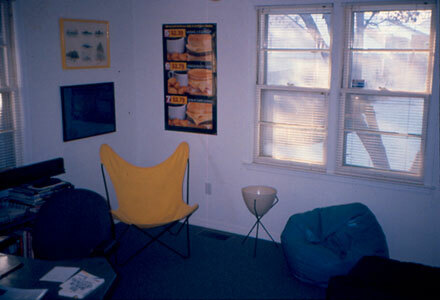 Watson, who wrote a graduate school thesis on Wright, designed and built 22 modular seating units for the den/media area. 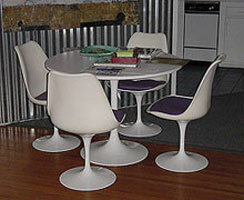 Watson designed and built the foam-covered table for the dining area. The base of the table - and those in the office - is a pedestal, thus cutting down on stubbed toes and banged knees. 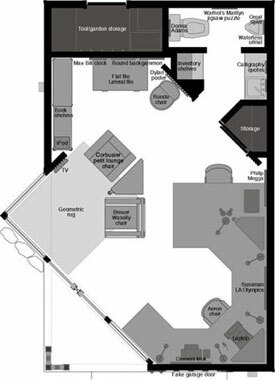 Watson's bathroom and even his laundry room are out of the ordinary. For instance, he dislikes stepping over a tub and under a shower curtain rod. 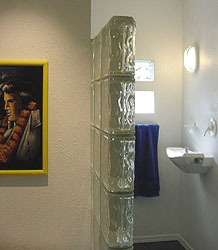 Therefore, the shower stall is defined by a wall of glass block. He dislikes cabinets under bathroom sinks. 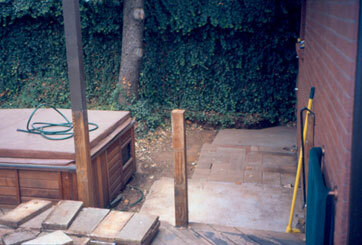 Furthermore, he didn't want a sink with a large protrusion from the wall or with visible pipes underneath. 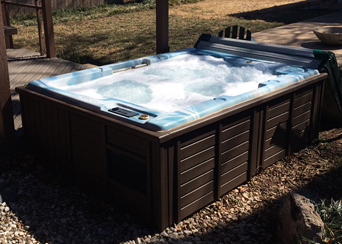 Persistence paid off; he finally was able to order one he liked from the manufacturer. Simplicity is a primary goal of Watson's. "We Americans are guilty of amassing stuff we don't need," he declares. 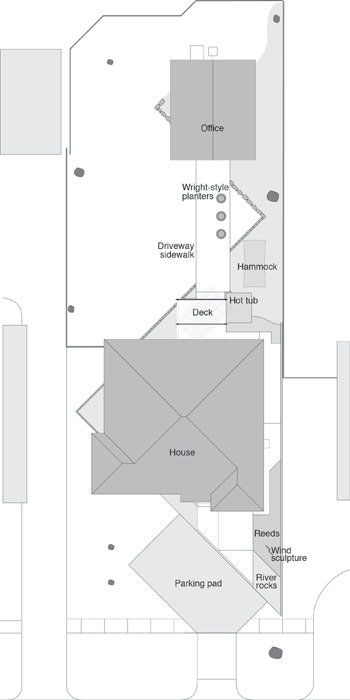 Some of the house's other features are a wall clock made of knickknacks, a slot in the laundry room wall so the dogs can come and go, a mail slot in the garage door, dimmer lights, a hot tub beside the deck, and doors that open with levers instead of knobs. 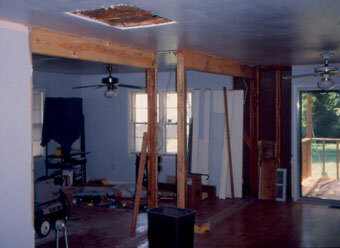 Watson paid $58,000 for the house and spent another $13,000 on the remodeling. 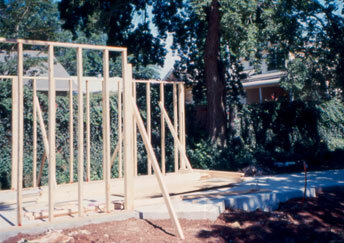 "I can't estimate the quantity of work that it took," he said. 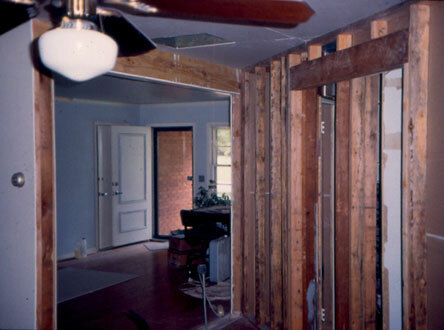 Resale was no consideration in the remodeling project. Watson is pleased with the naborhood and the nearness to the UCO campus. Living with him are his two dogs, Dallas and Austin. 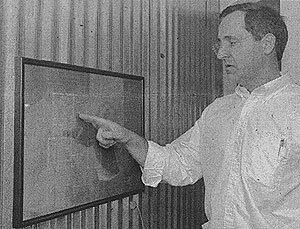 Watson grew up in Dallas and went to the University of Texas in Austin for his undergraduate work. He has a master's and doctorate from the University of North Texas. A glance at Watson's watch reveals it has only one hand. A peek at his eyeglasses will show they have no frames over the lenses. What else would one expect from a minimalist? Dr. Jim Watson, professor of design at UCO, describes his life as a minimalist and why 'less is more'. In a world increasingly filled with the clutter of comfort, UCO's Dr. Jim Watson has less, by design. 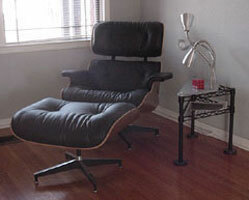 The design professor, a devotee of architect Frank Lloyd Wright, said he is a minimalist. That means no knickknacks, no undersink cabinets, and few walls. 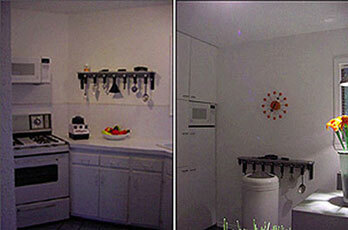 Instead, Watson filled his house with functional items that also happen to be decorative. 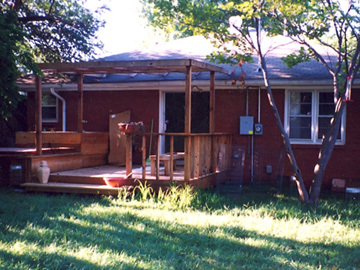 The overall effect might be described as a loft-tech-meets-Oklahoma-prairie look. "This house allows me to address all my pet peeves," said Watson. 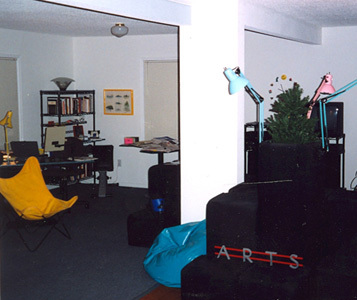 Wasted space and time, obtrusive decorations, and hard to use or uncomfortable items have no place here, he said. 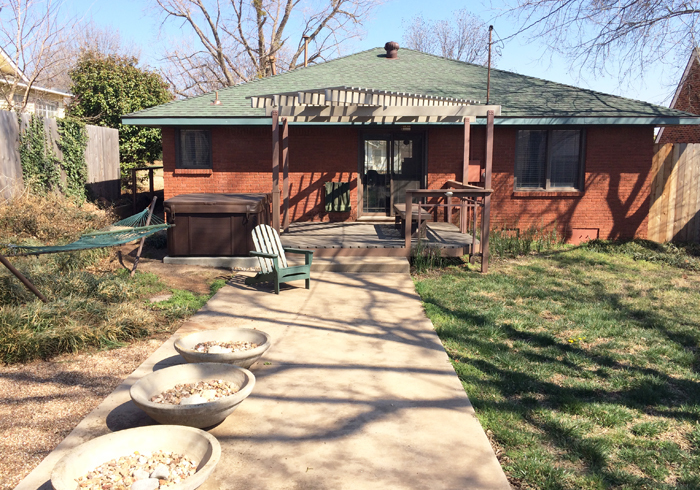 On the front porch of the typical 1950s ranch style Edmond home, Watson explained why less is more and how the ordinary house lent itself to the simple life. 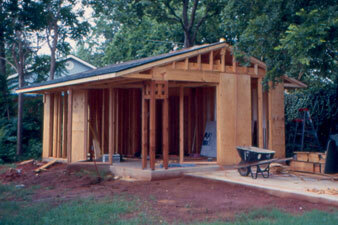 "Its all suburban kind of architecture. 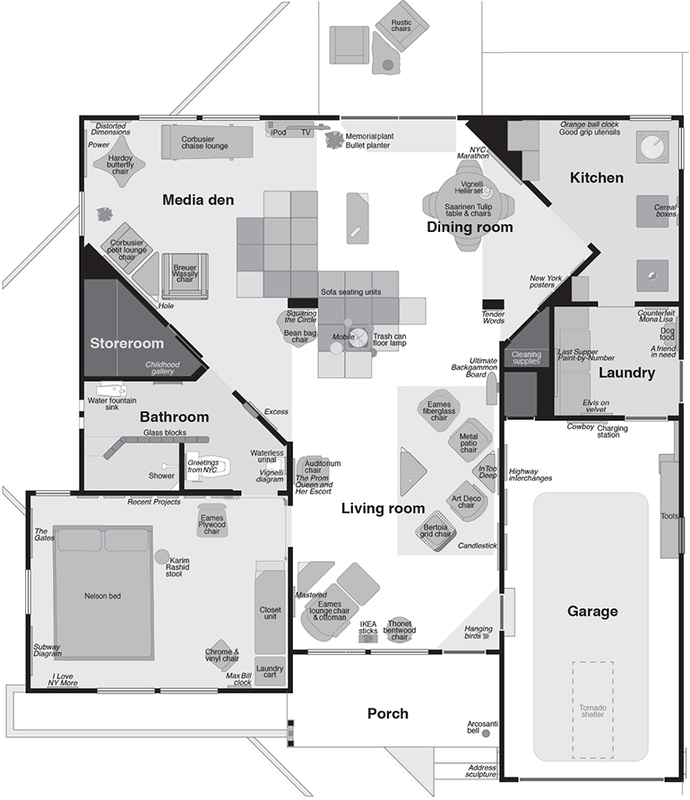 One story, simple floor plan, etc." 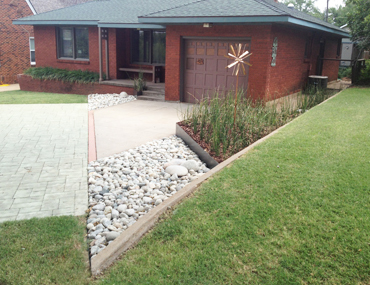 The front planter is of Roman style bricks, noted for their long thin shape and used extensively by Wright to convey a low horizontal design that is in tune with the lines of the prairie. 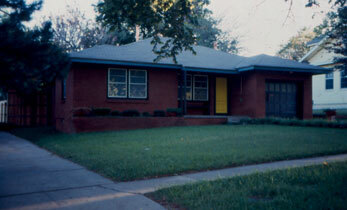 There was a lot of interest in Wright's work in this area at the time his house was built. 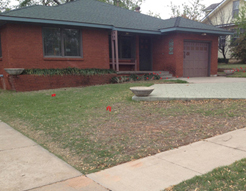 Wright even called his style of wide houses with open floor plans the prairie Style, said Watson. Roman brick is one example of Wright's design that is meant to draw the eyes to the side, he said. 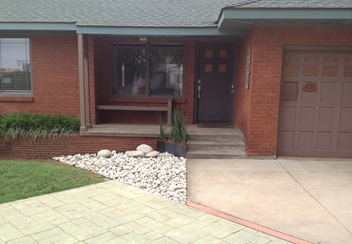 Shutters and wrought iron railings were removed, bushes trimmed, and planters added to enhance the strong horizontal line. "The simpler it is, the more beautiful it is," he said. 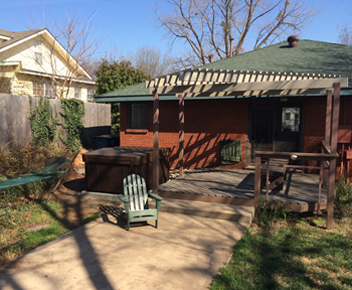 The house at 424 East 4th Street is in the old Edmond naborhood of Capitol View where residents plan to form a historic preservation association soon. "Right across the street is the old Clegern house," said Watson. 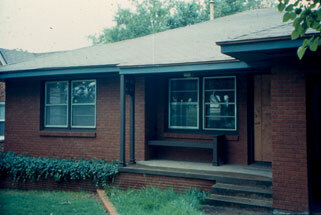 The Clegerns were Edmond pioneers. The old farmhouse was probably built in the teens. "Its still there. Now we have a Clegern school and Clegern Drive. 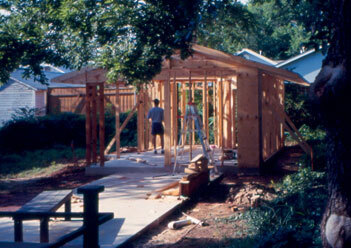 When Watson bought the house last year, it required extensive work to achieve the simplicity Watson desired. "We had six weeks of real serious work: I had electricity only in the bedroom so if I took a shower at night I had to take a lantern in there. "I had about two weeks without a shower, but fortunately I could shower outside since it was August. And I had a week without a toilet. I won't talk about that," he said. 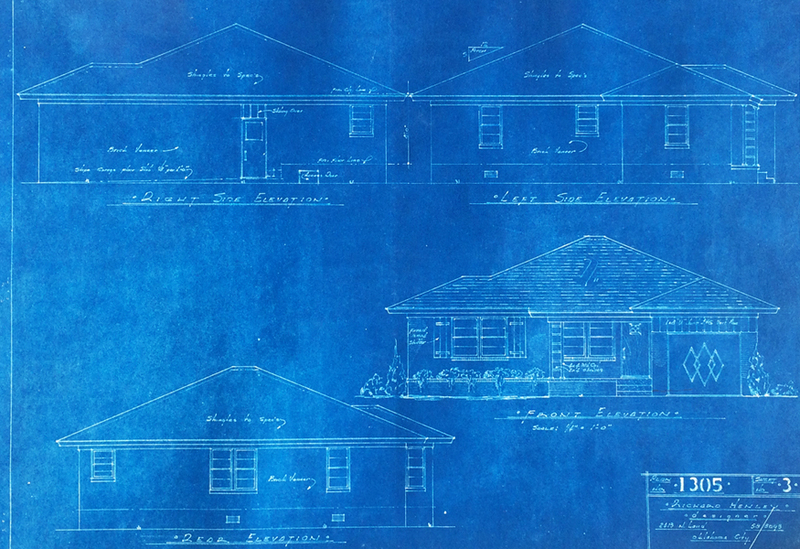 When the walls were demolished, workers found an original set of blueprints for the house, designed in 1952 by Oklahoman Richard Henley. Because this find simplified the task at hand, Watson reacted as if he "had found a treasure map." 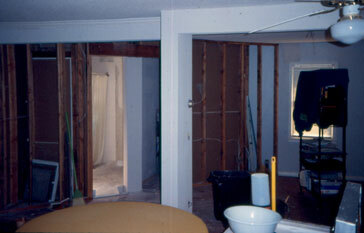 When the remodeling was finished, he had something even better, he said. 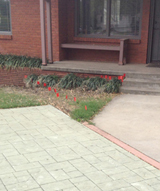 Mailcarriers especially appreciate what Watson has done to the old house, even Watson has to train them to find it. A hinged panel on the garage door swings inward to reveal a drop box for Watson's mail. "The postman loves it because he doesn't even have to slow down," said Watson. 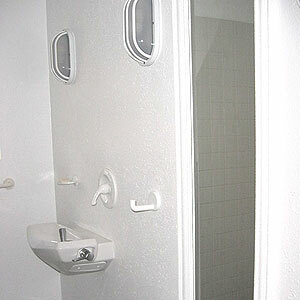 In the bathroom, the shower has no shower curtain. 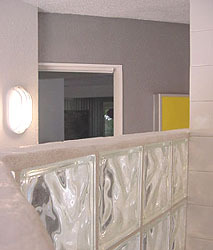 1930s style glass blocks serve as the walls of the stall and as windows that provide light while maintaining privacy. 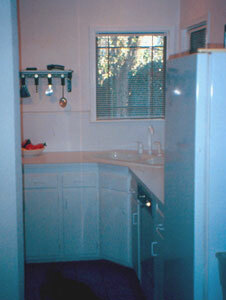 A pristine white sink juts directly from the wall with no visible plumbing or supports. 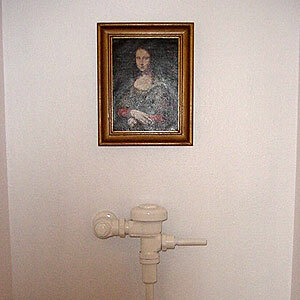 The 'sink' is actually a commercial modern drinking fountain. 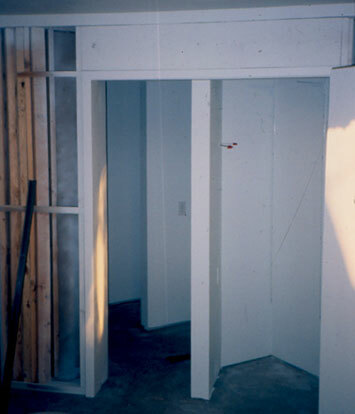 The pipes are hidden within the unit and run behind the sheetrock. Appropriately hung over the toilet is a colorful oil painting of Elvis on black velvet. 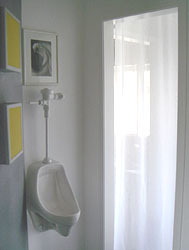 "It's fitting that it should hang in the bathroom - that's where he died, you know," said Watson. Watson has two roommates. 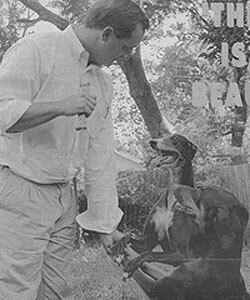 Austin, a space-saving greyhound Watson found on the Bailey Turnpike, and Dallas, an exuberant Doberman-type mutt who adopted him from the pound. "I spend a lot of time on the highway," said Watson of his dog's names. 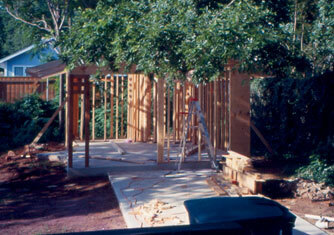 (Written before the kitchen and office remodel in 2002.) 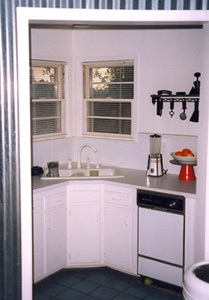 The kitchen is a white recessed space that steps down into the laundry room, where faucets project directly over the dogs' bowls. 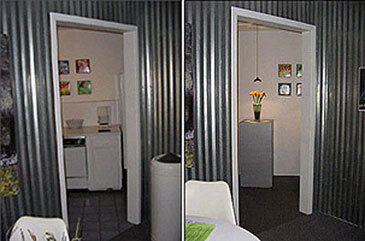 Unobtrusive recycling bins fit under and to the side of a narrow refrigerator. In the silverware drawer, black handled utensils are lined up in a wire basket like a display at Pier One. A stainless apple corer has found its way into the drawer. "That doesn't belong there," said Watson, apparently restraining himself from relocating it. 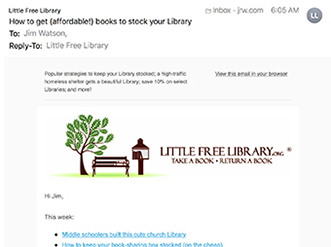 Don't even ask to see Watson's 'junk drawer.' 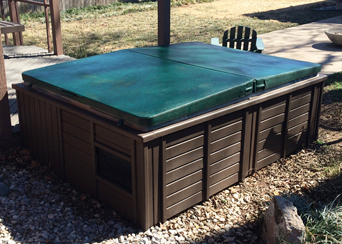 Minimalists don't have junk drawers," he said. Nor do they have sofas, closets, or elaborate wardrobes. Collections, however, are acceptable if they have function. 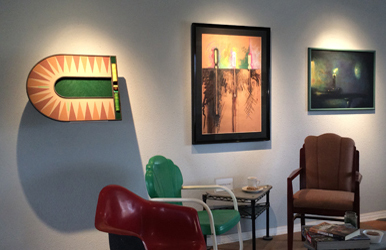 Watson offers a collection of chairs representing 'classic '50s, Art Deco, and vintage UCO dorm styles for visiting and conversing. "People come in and get to pick where they want to sit," he said. A decorative time piece is really a collection of pop icons displayed on the wall in a circular pattern centered with a generic clock movement. "This way "it becomes more than just a clock. Its functional art." 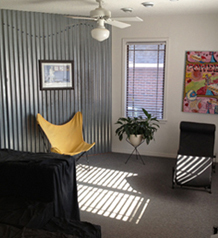 An open house plan has spurred plans for an open house of a different kind for UCO design professor Dr. Jim Watson. 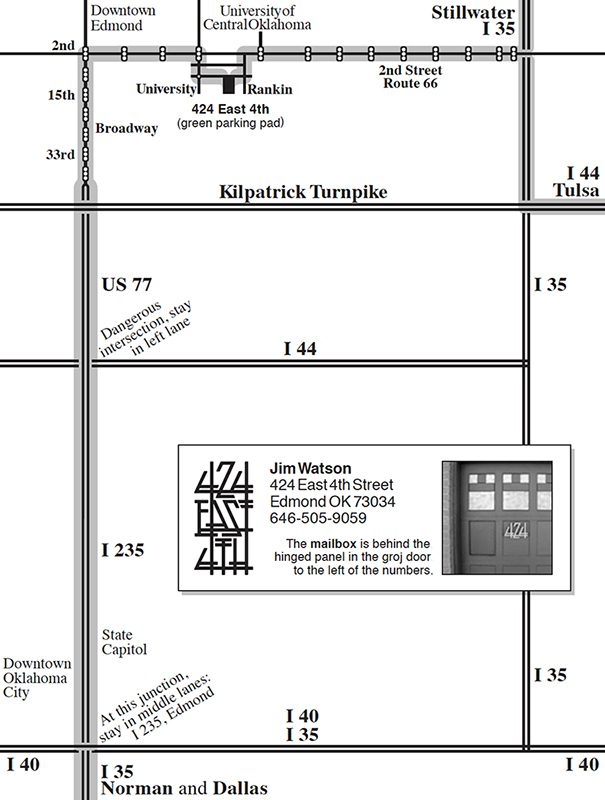 People who got a glimpse of Watson's unusual home in The Vista's September 17 issue can see the whole thing for themselves at his open house at 424 East 4th Street on Sunday, October 13, from 1-5pm. 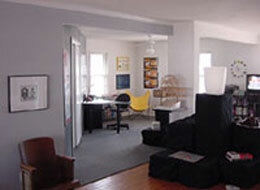 The house, within walking distance of campus, incorporates the industrial loft look Watson admires. 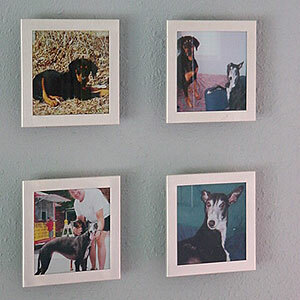 But friends and visitors will be mistaken if they expect loft art to adorn Watson's house. Watson is a minimalist. 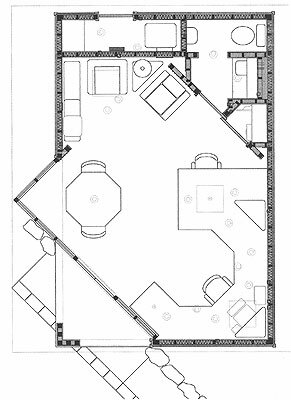 The Vista's September 17th article described how the principles of Frank Lloyd Wright and Japanese and European minimalism transformed his ordinary house into a showcase of functionality and enduring design. Since then, Watson has been a busy man. "For the first week or so (after the article) I could barely walk from my office over to the Student Union without people wanting to talk to me about my house," he said. Several phone calls a day and even some curious visitors have prompted Watson to host the open house. Everyone, especially members of the UCO community, is welcome, he said. 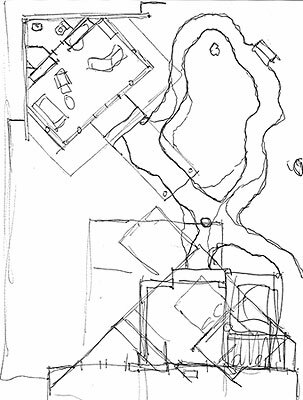 Although Watson enjoys expounding on the minimalist concept, true to form, he has prepared a brochure to expedite the process (info now on this website). 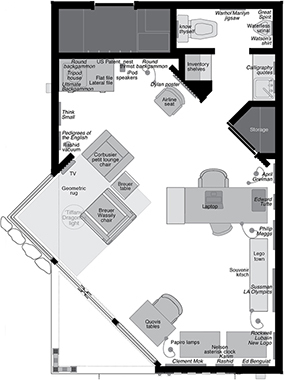 The graphic yellow and black self-guided tour booklet ushers guests through the bright yellow door, through the five room house, and even into the bathroom where the 'King' is enshrined on black velvet. 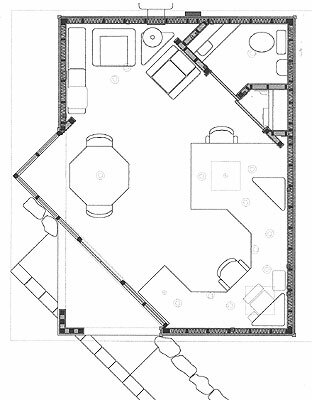 Modifications to the 1952 design transformed the architecture of the house, so typical of the era, to meet a minimalist theory of structural simplicity that suits Watson's busy lifestyle. 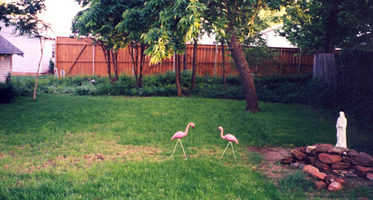 Visitors to the Open House can check out the newest addition to Watson's minimally mowed back yard - pink flamingos. Below: The floor plan of Dr. Watson's house before and after renovations were made. 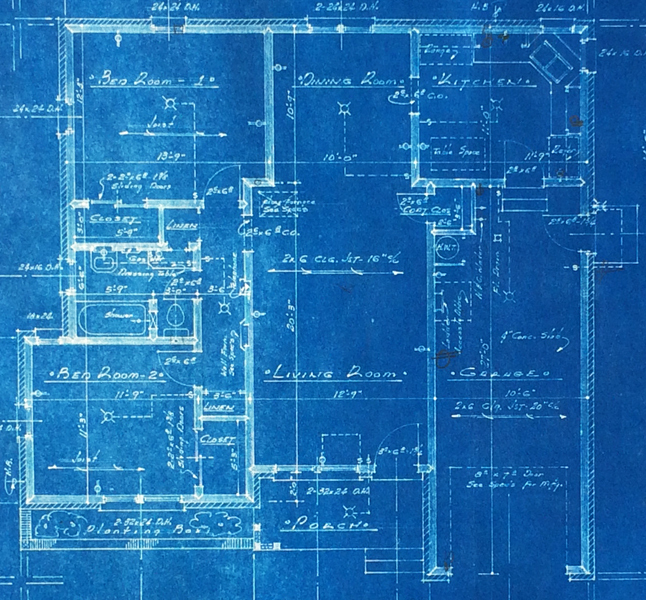 The history of the office might have been something like this: Back in the 1930s, this lot had a simple bungalow house with a garage in the rear. 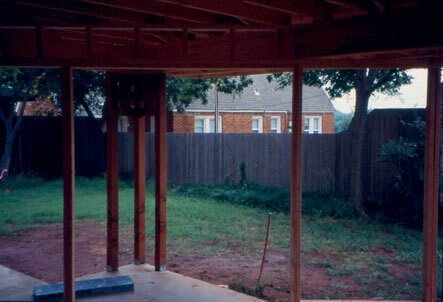 Remnants of the driveway, the original garage structure, and the garage doors have survived and can be seen as part of the current office structure. 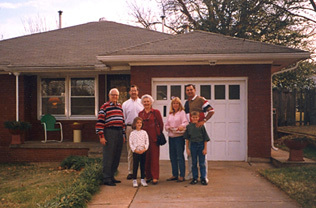 In the early 1950s, the garage was remodeled into a living space for the owners while the frame house was torn down and replaced by the current brick house. 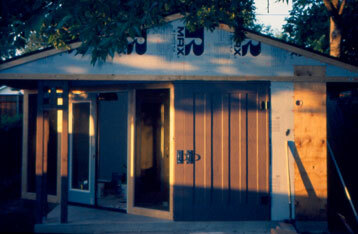 Once that house was complete, they moved into the house and remodeled the garage into an office. The actual design of the office was developed during the winter and spring of 2000. 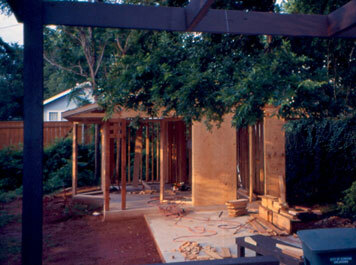 Construction took place during that summer of 2000. 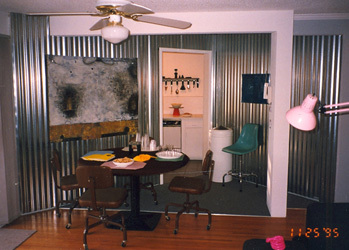 The office uses similar materials as in the house to connect the two structures with unified visual themes. A diversity of spaces is more productive. The new concept is called activity-based workplace design, tailoring spaces for the kind of work to be done. 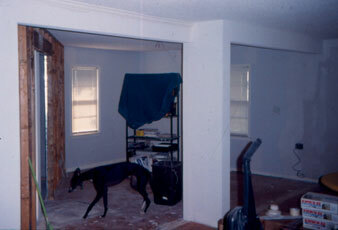 I had a dog door installed in the house the day before moving in 1995. 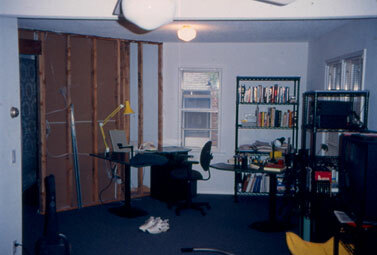 But, when the office was built in 2000, I didn't think it would be as necessary. 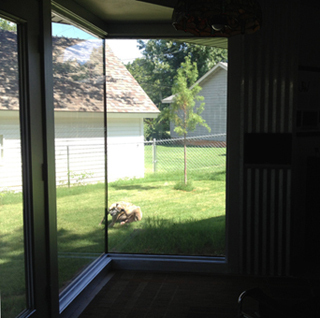 After more than a decade of getting up to open the door for the dogs, I finally installed one there, also. 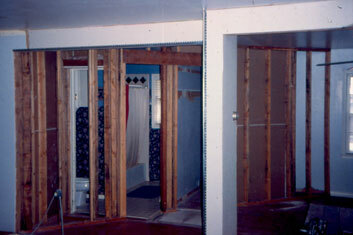 I tried several different models and finally just bought 2 doors that matched the one in the house and installed them between the studs in the bathroom. 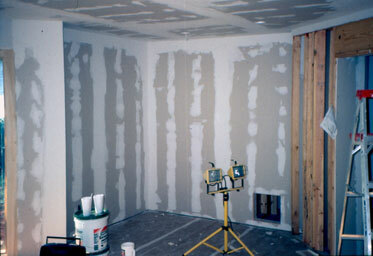 I filled the depth of the wall with some white tin flashing. 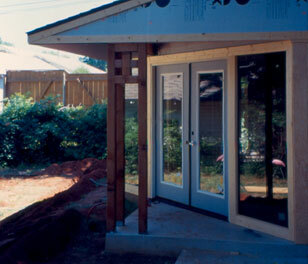 The double flaps helped insulate and weatherproof the door and the opening. The dogs, Manhattan and Brooklyn, adapted to the new door easily. 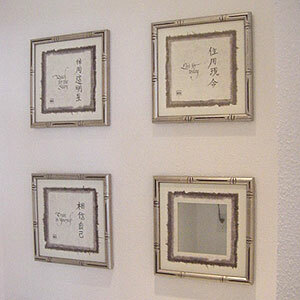 • Japanese and European interior minimalism. • Furniture built appropriate for the space. 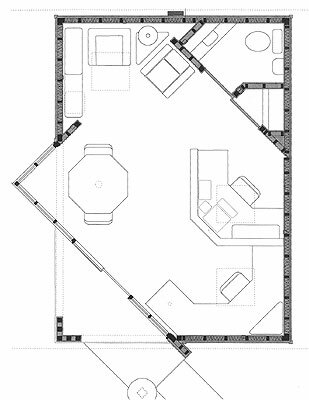 • Wright's open floor plans with areas that flow into one another. 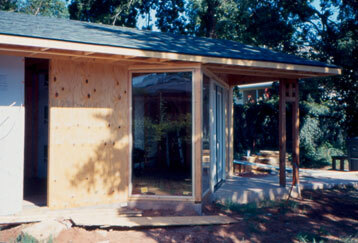 • The 424 house: materials, colors, and angles mirror those in the house to unify the structures on the lot. 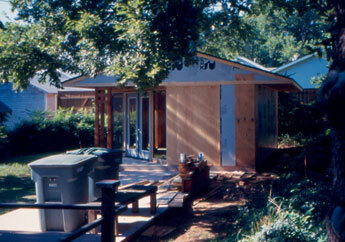 • Research at University of Oregon: exposure to sunlight and outdoor views = 6% fewer sick days. 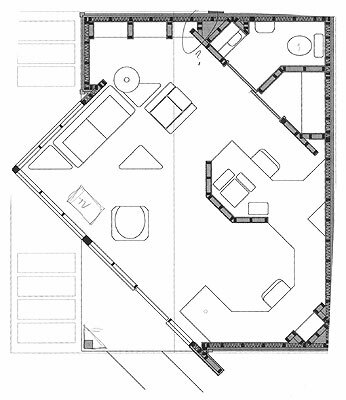 • Work area: open, minimal, flexible project areas. • Teaching prep: prepping course lectures and projects, grading, and archiving projects and student files. 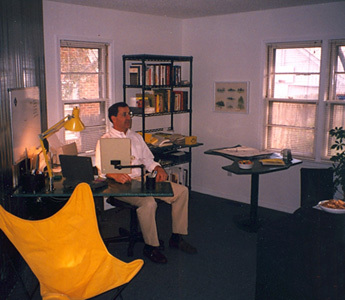 • Weblishing: writing essays and the WensdayDesign blog. • Creating and producing design products. 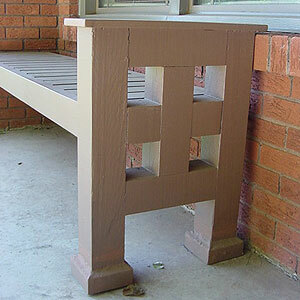 • Porch column: Mimics the Arts & Crafts motif column on the front porch of the house. 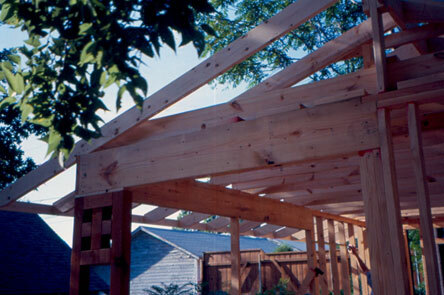 The porch is created by slicing a corner off the garage mass - the angle unifies the office with the deck canopy and interior walls of both the house and office. 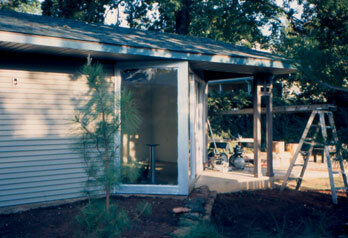 • Exterior walls: Vinyl siding to convey the backyard garage motif and for ease of maintenance. 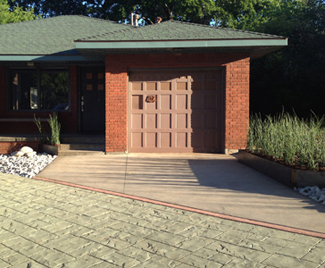 The front has a faux garage door and Mission style lighting. 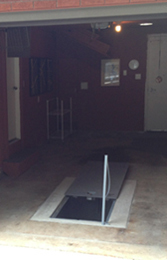 • Floor: Sealed concrete floor to continue the old garage theme and an area rug with geometric patterns. 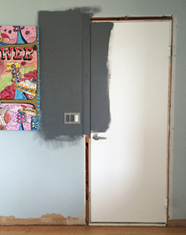 Later, in 2017-18, painted the same grey that is on the walls of the house. 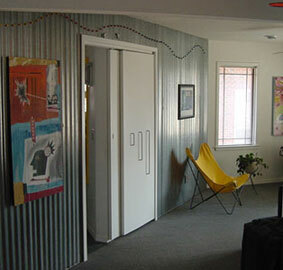 • Interior walls: White walls and corrugated tin that once matched those in the house. 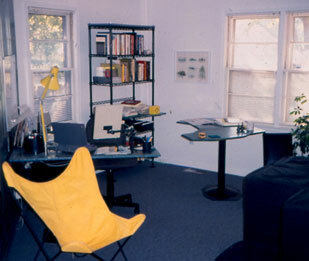 I made a few changes to the office in the summer of 2007 in order to accommodate the books, papers, and items that i brought home from the school office after retirement. 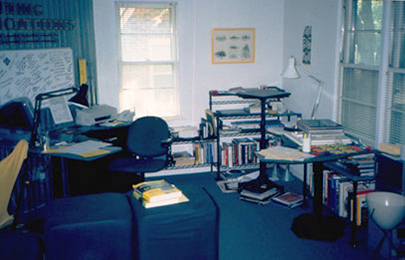 Additional refinements were implemented in 2010 to better accommodate the needs of jamesrobertwatson.com and after purging the slides, files, and books amassed during 30 years of teaching. 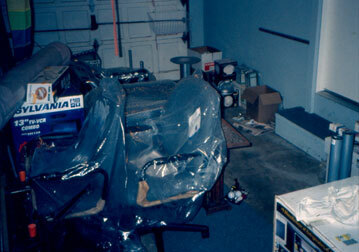 • Removed the octagon table (I didn't use it very much) and one Ronde chair. 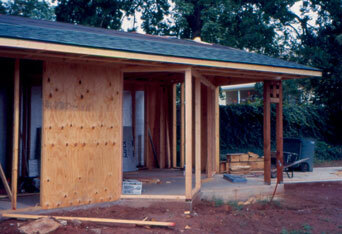 • The back of the office is now dedicated to resources and storage. 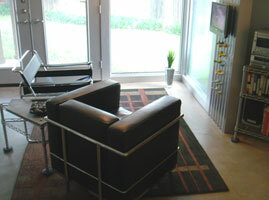 • Installed a flat-screen television for the sitting area. 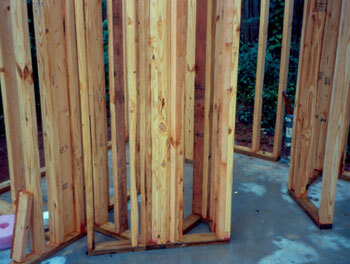 • Put in a large lateral file. • Moved in the flat file from the school office. 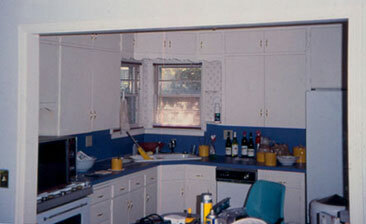 • Removed the refrigerator and microwave and installed shelves for product inventory. 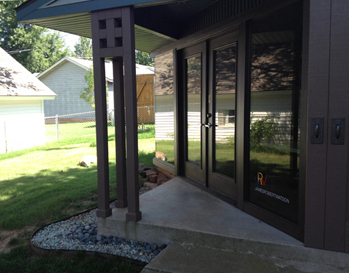 • Installed a JRW jamesrobertwatson sign on the front window. • Added an airline seat, 2013. 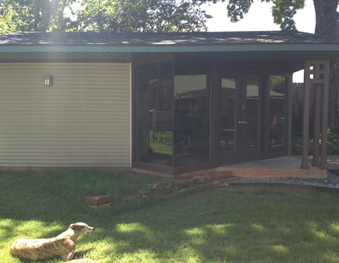 • Replaced the corner windows with no vertical mullion, July 2013. Below: I switched the location from the southeast corner to the southwest corner of the lot - to take advantage of a vista looking towards the northeast and it became a 'garage' structure.